It felt rather novel laying in the Hilleberg Enan listening to the sound of wind and rain. I felt warm and snug and it was an effort to remove myself from a warm down filled cocoon. 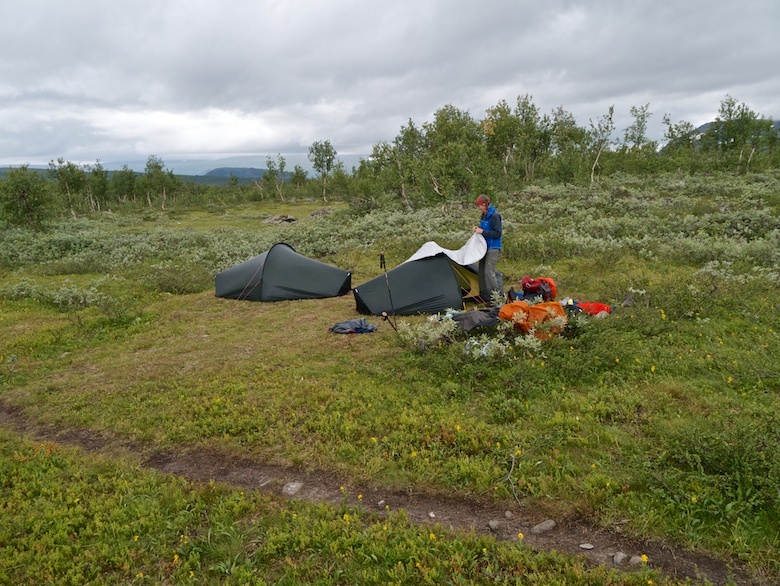 We had pitched in an exposed spot the night before, the tents shrugging off the stiff breeze. We both emerged into a world transformed from the past five days. 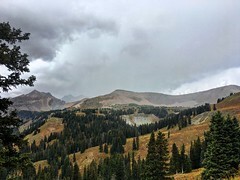 The blue skies had been replaced by sodden grey clouds sitting heavily on the surrounding peaks. Although much of the views were now hidden the change in weather gave more drama to the landscape. 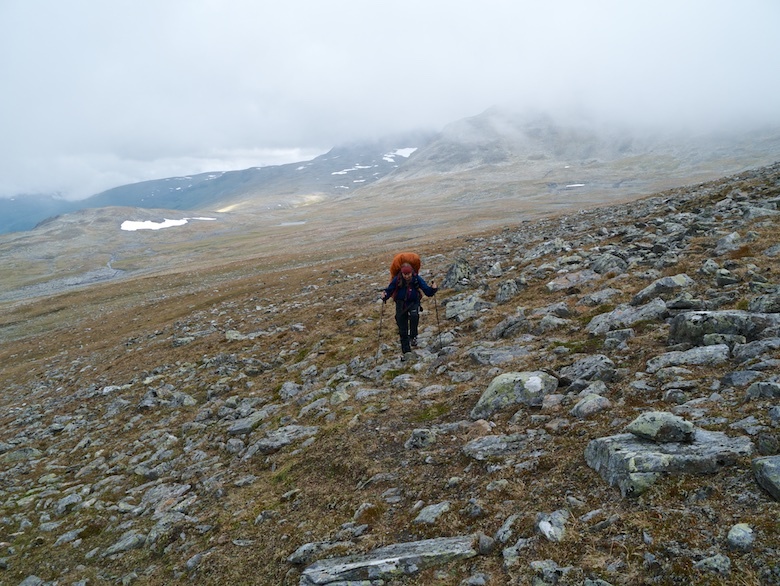 Rather than dropping down to the reindeer herders hut to pick up the path we simply climbed over a saddle behind a low rounded peak. On the horizon we could see the line of metal posts that we had followed on the route out. It gave us something to aim for whilst the clouds teased us with their presence, often reducing the view ahead. 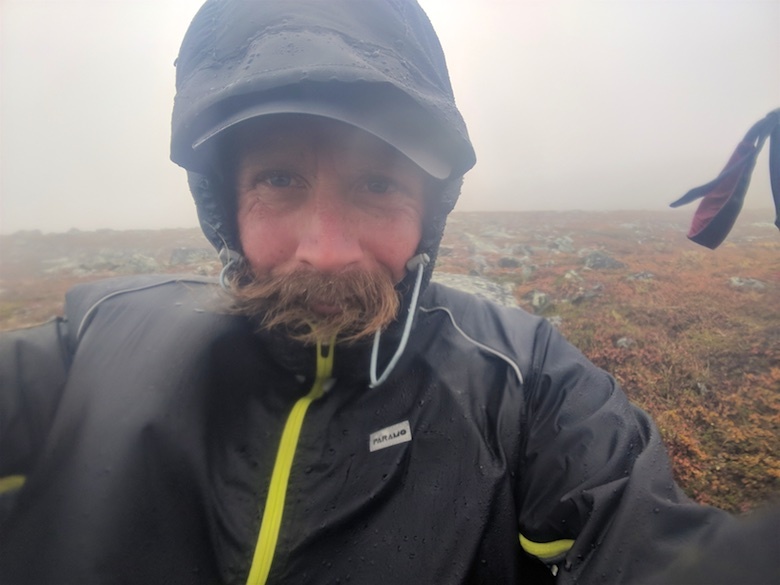 I was glad that we had previously done this route in good weather as it would have been tough not knowing the terrain, the highest parts were totally clagged in. 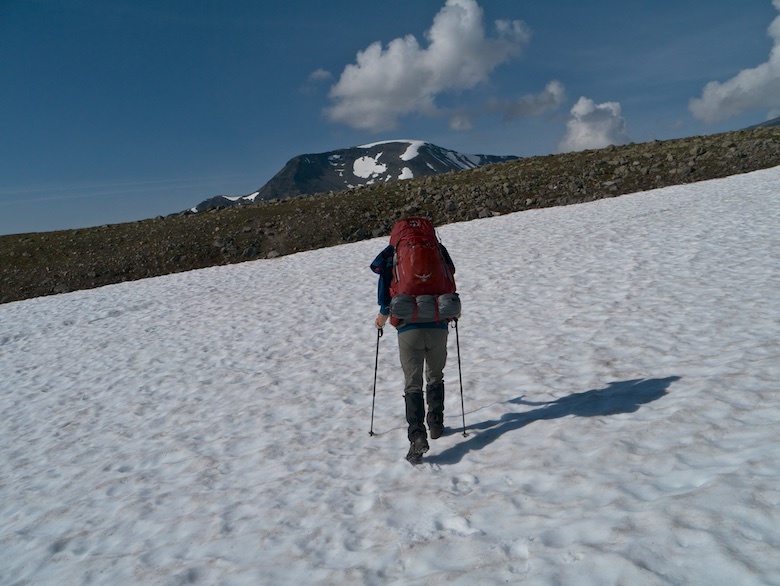 We remembered to leave the line of posts at the correct place, just after a large snow bank blocked our descent route. The rain had made it slick and icy and we detoured around a significant portion of it. The way ahead was indistinct, we lost the sketchy path, doing our best to aim for the same spot where we had crossed the river a few days before. 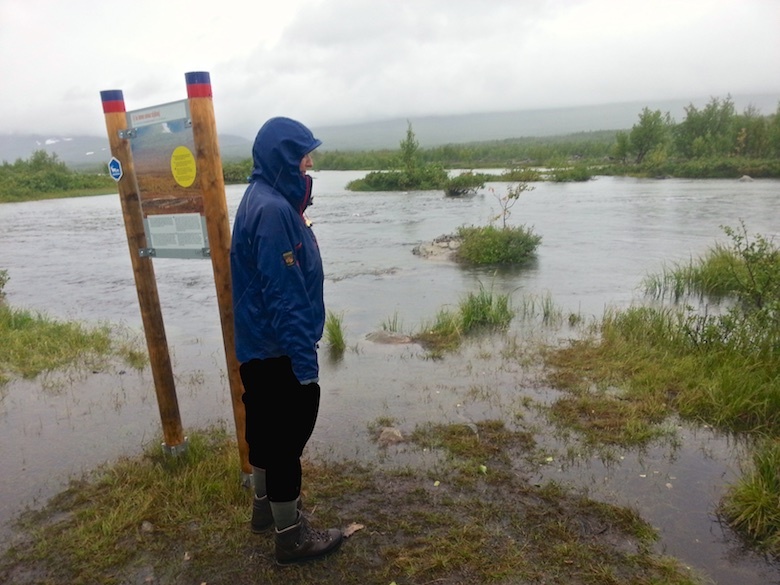 We managed to arrive at the exact spot, getting over the now faster flowing water with no difficulties. 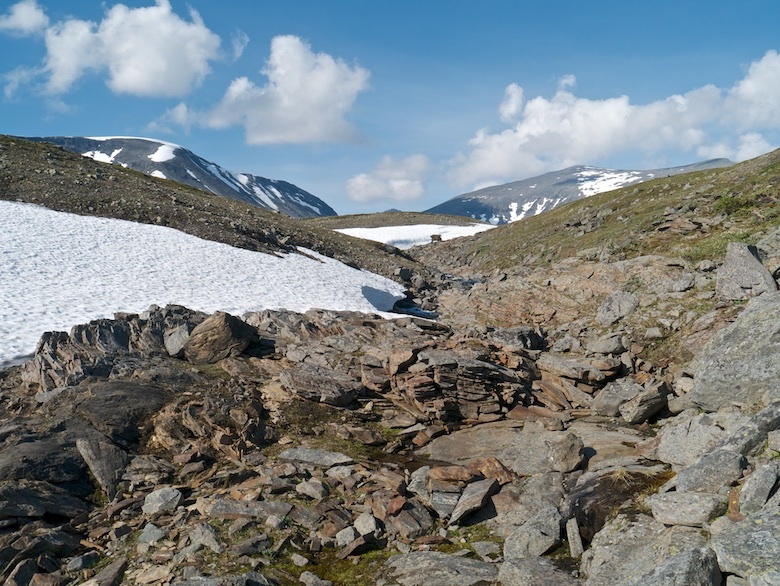 The next test was to cross further trackless ground to find the snow bridge over the next much wilder river. I was pleased that we navigated well, finding it on the first attempt. Once again it was slippery, patches of ice hidden amongst the snow. 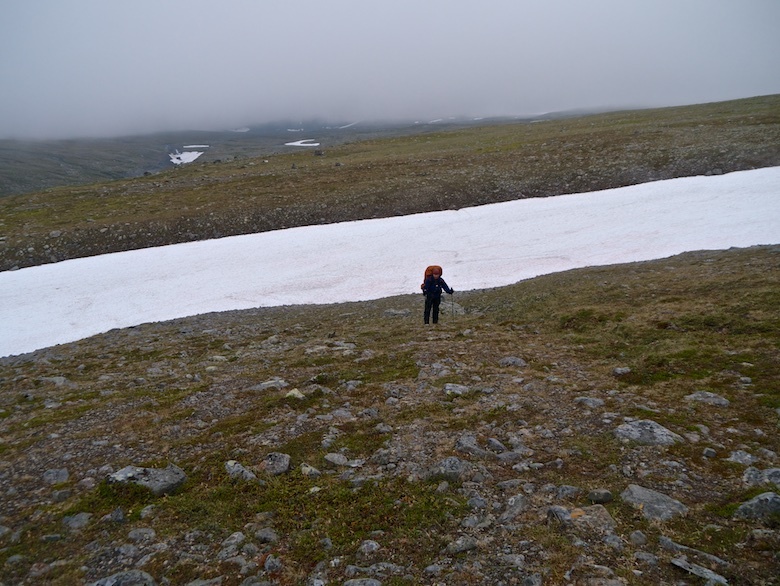 From a distance the snow looked like it was covered with blood but I think that it must have been some sort of algae. 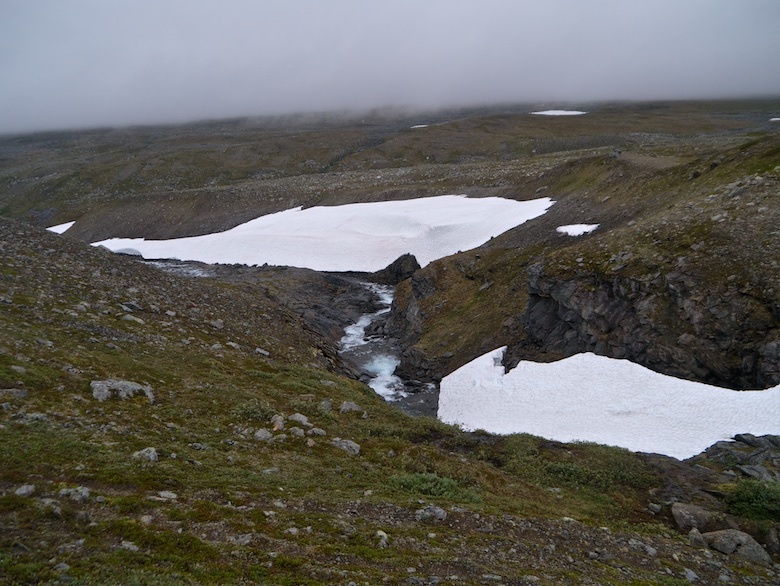 Once past the snow bridge we picked up the good path that took us all the way back to Parek. We passed a solo backpacker who was not too keen on stopping for a chat. 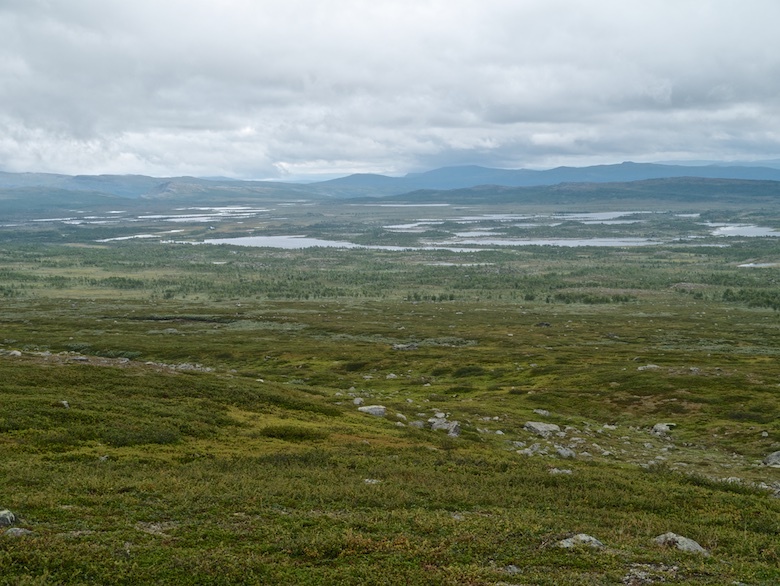 After such an exposed walk it was good to see the Parek bog below us once again, although I was not that enthusiastic about having to walk it again the following day. 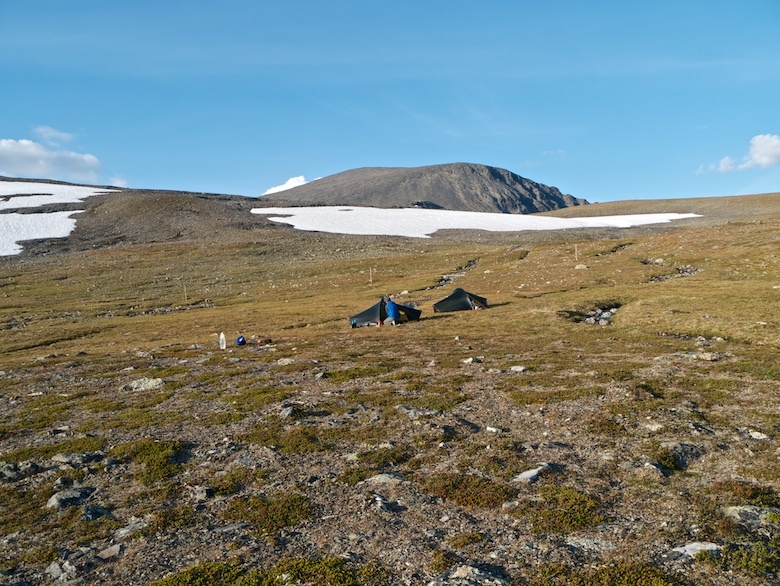 We found a great little camping spot at the top of the tree line at around the 800 metre contour. Whilst pitching we were passed by a young German trio heading up into the mountains. With it being late afternoon and the weather closing in I’m not sure that they made a wise choice. Any camping spot up there would be exposed and the weather was forecast to get worse. We attempted to sit and cook outside but spots of rain saw us retiring early to our tents. It hammered it down all night and the wind blew in big gusts (according to Chrissie) but I managed to sleep through the worst of it. 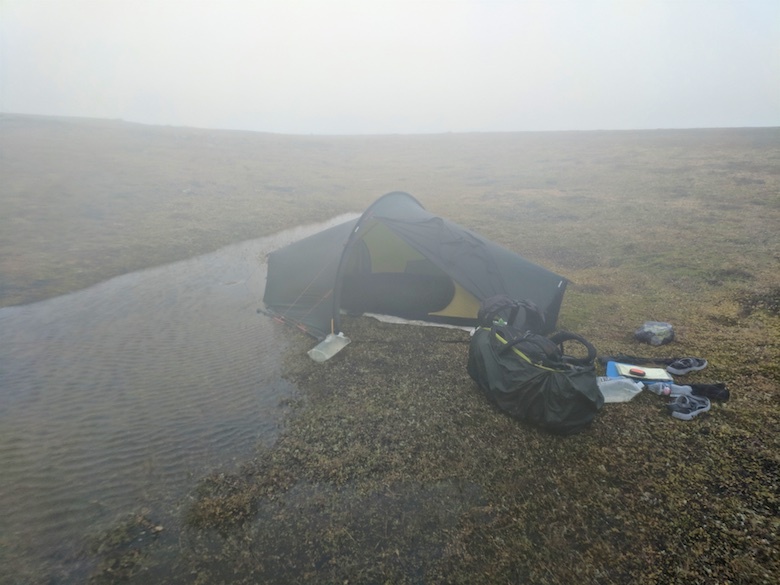 It was wet and windy the following morning, not the most ideal conditions in which to break camp. One of the nice things about the Enan tent is that it is easy to separate the inner from the outer and pack it away dry whilst undercover. Chrissie had to come to the rescue when a big gust of wind meant that I got my fly sheet tangled on the local vegetation. It was clear that it was going to be a damp sort of day. As we descended through the forest the path was running with water, vegetation dripping on us we brushed past. 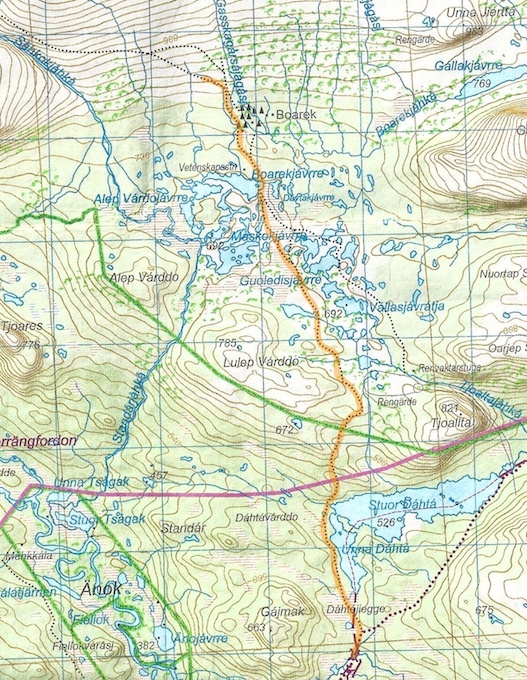 There are numerous small streams unmarked on the map, most of which we had not even noticed a few days before. So much rain has fallen that even these meant wet feet when crossing, one proving tricky. My mind turned to the upcoming large river crossing between two lakes, it turned out that Chrissie was also thinking the same thing, although neither of us initially voiced this. The first bit of fun came at a marshy section prior to the main river. On the way out this had been crossed by a wooden platform which was now detached and floating on a large flooded area. There was no way that we were able to get across. Luckily a detour around the edge of the marsh and a bash through some trees got us to the river itself. It was huge! The wide and placid river we had crossed a few days before had burst its banks, the wooden triangles showing the way across now hidden. There was no way of knowing how deep it was without giving it a go. On the positive side it flows between two lakes so there was not much of a current, at the very worst we would have to swim! Chrissie was very unhappy about the situation and was convinced we would both die. Although I was nervous about the whole thing I pretended that it was nothing to worry about. Hopefully that rubbed off. Anyway it’s not like we had much of an alternative! A few minutes later we were stripped down to our underpants, wearing boots and waterproof tops and big rucksacks. With the rain pouring down we must have been a bit of a sight. 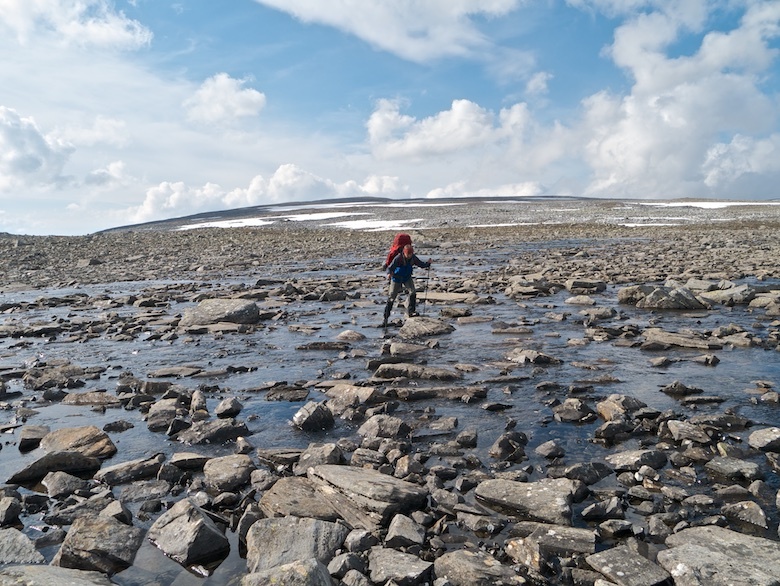 The crossing took what felt like an eternity, the rocks being slippery and the cold water coming up to our waists most of the way across. You have not lived until you have emerged from a freezing cold river, soaked from the waist down whilst heavy rain falls from a cloudy sky. Here are a couple of photos showing what we managed to cross. Can anyone tell which brand of trousers Chrissie is wearing in the photo below? 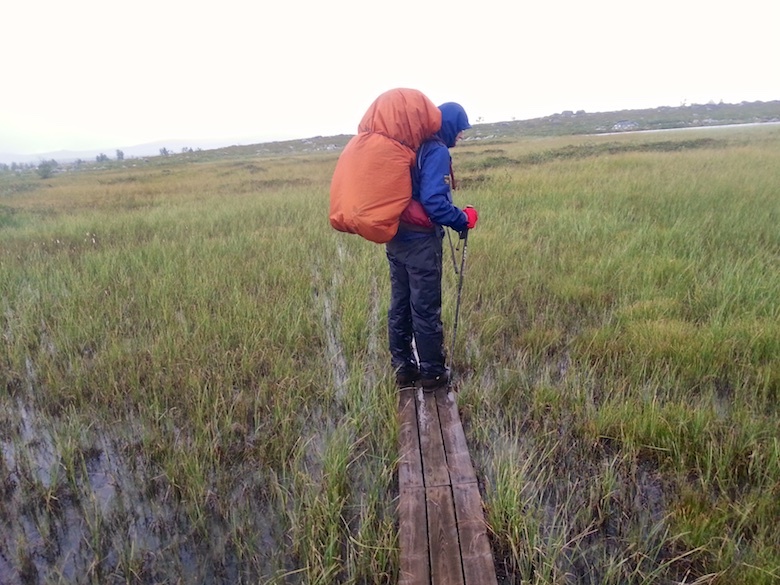 Rain fell for the rest of the morning as we crossed long sections of bog, thankfully protected by duckboards. The weather matched the mood of the landscape. Our goal for the day was the campsite where we spent the first night of the trip. This would then leave us with only a few kilometres the following day, so that we did not have to rush for the early afternoon bus. 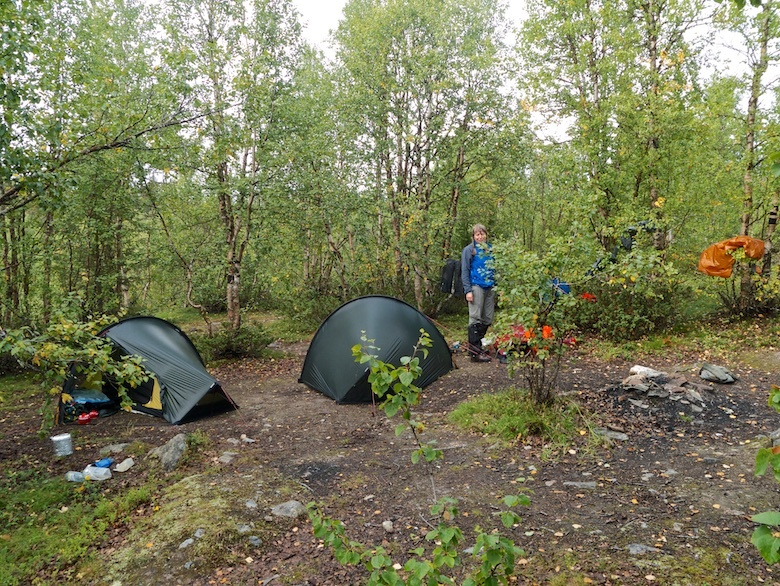 This time we were the first to arrive and had the pick of the best spots, although that still meant pitching on bare earth, the best way to get a filthy tent. It was another evening where the weather drove us inside early, some of the showers proving to be particularly enthusiastic. It was around dusk when the ‘fun’ started. 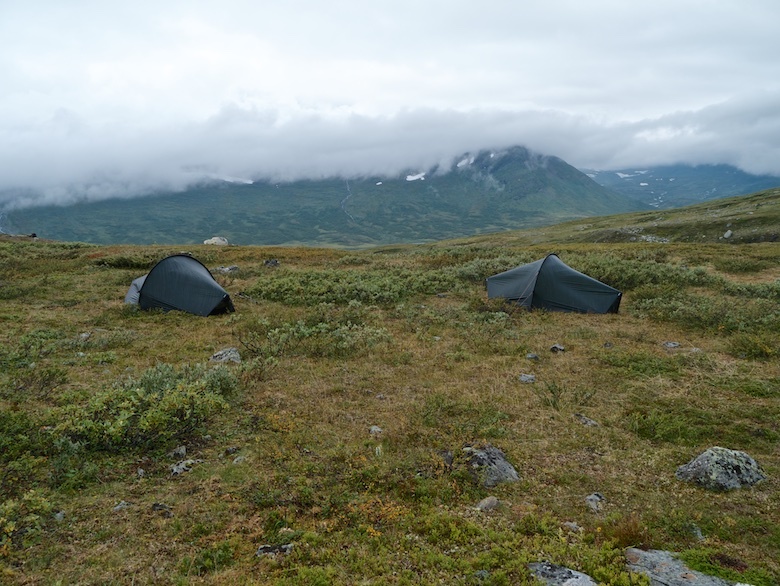 Our tents got invaded throughout the night by an army of Arctic Voles. They were brazen little things, waltzing into an open porch in plain view. I actually had to smack one to make it run away! 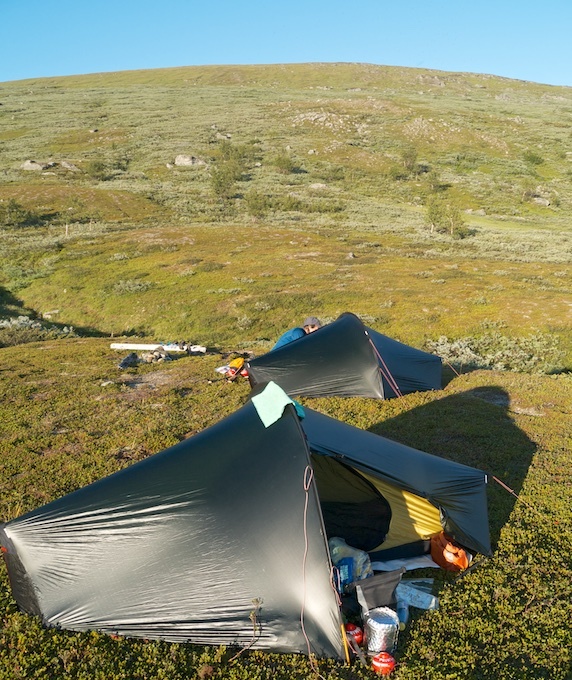 The end result by morning was a pair of stressed backpackers with chewed tents. 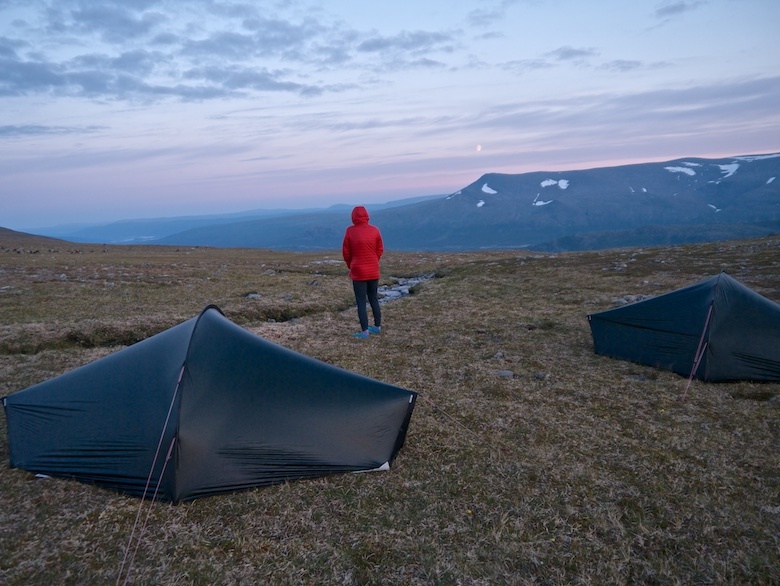 Luckily they did not feel the need to chew the flysheets, they were more interested in joining us in our inner tents. I ended up with one small hole in my inner whilst Chrissie ended up with two much larger holes. 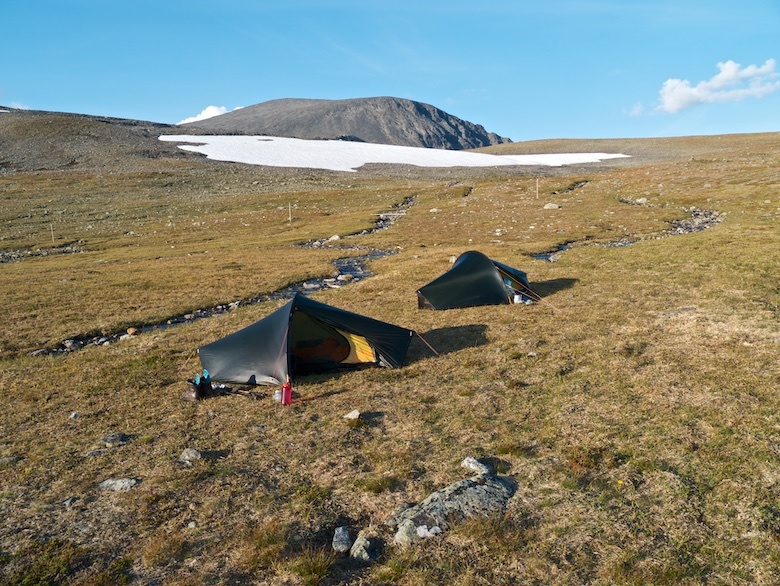 One must have joined her during the night as she found a chewed bag inside the tent at the opposite side to the holes they had made. 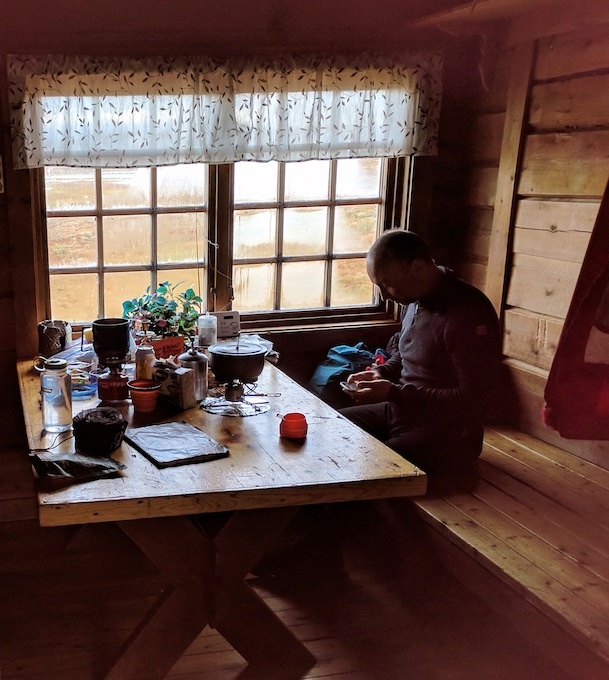 We were both a little battle weary by the time we packed our soaking wet tents into soaking wet packs, put on soaking wet waterproofs and set off down the trail to Kvikkjokk. The few kilometres passed quickly and we were back at the STF hostel with a couple of hours to spare. We picked up the bag of clean clothes we had stored there and paid about £5 each to use the shower. After wearing the same clothes for eight days it was nice to have something clean to wear. The lunch at the hostel was good, setting us up for the long bus journey to Murjek, followed by the train to Luleå. 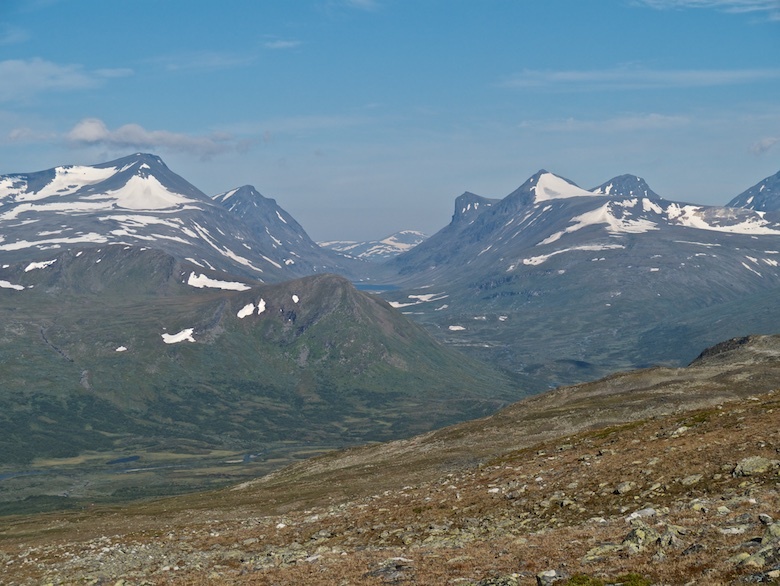 I have to say that I am totally smitten with the north, three journeys to Swedish Lapland and I am already planning the fourth. Where to go next is the question? The possibilities are endless. If the demand is high enough I might do a short gear shakedown post, what worked and what didn’t, that sort of thing. On the other hand I might not. I was up and out of my tent by 7.00am. Chrissie was up before me, standing looking down at the river, her face full of worry. It was clear that she was not keen at attempting to cross the river and I was careful not to push her into doing something she was not comfortable with. I would be lying to say that I was not disappointed, being keen to see the two lakes further up the valley, nestled amongst mountains of sheer black rock. 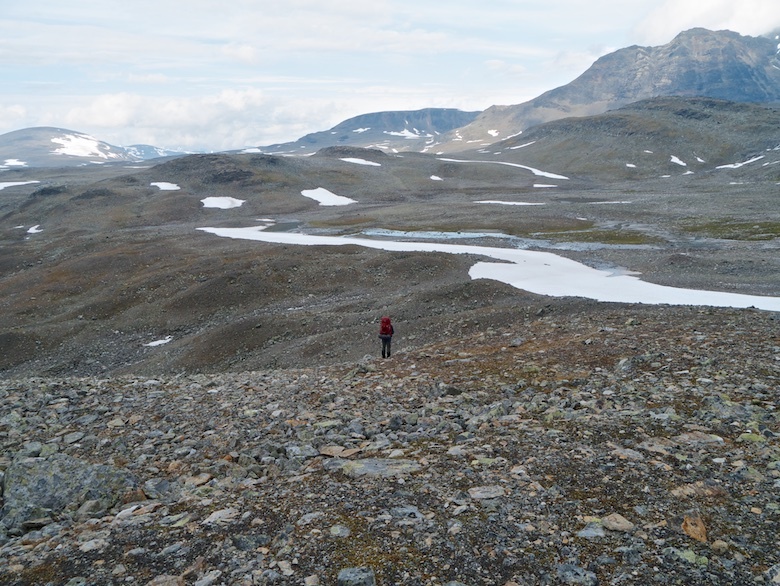 However we had come to Sarek as a pair and that means compromises. Continuing the planned route was out of the question (an extra person and a rope I reckon would have got us safely across). I therefore set about persuading Chrissie into doing an alternative high level route I had cobbled together the night before. I had traced a line through areas where the contours widened out, linking together several shelves amongst steeper ground. 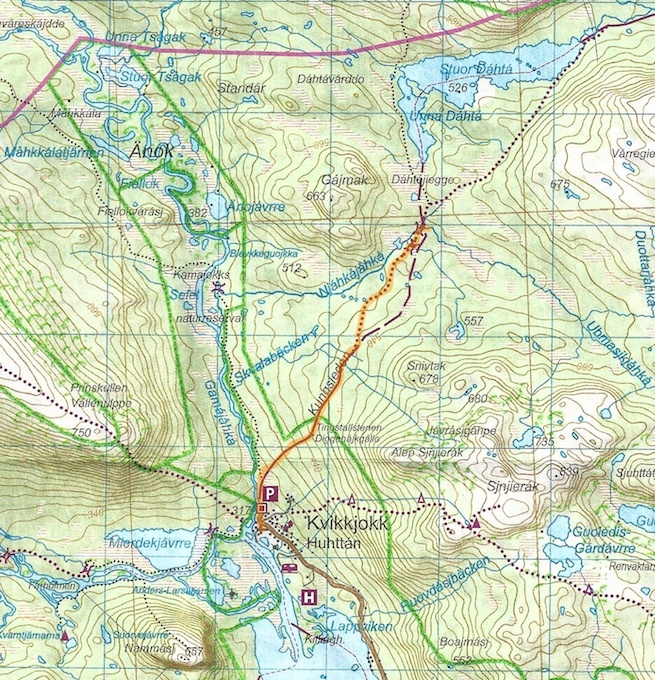 The scale of the map is 1:100k and lacking detail, conditions under foot being a bit of a lottery. I was hoping that none of the steeper slopes would be covered in snow. Chrissie was willing to step into the unknown with me and give this mountain alternative a try. The only other viable route was to return the way we had come, neither of us really fancied that. It was still early when we left our campsite. 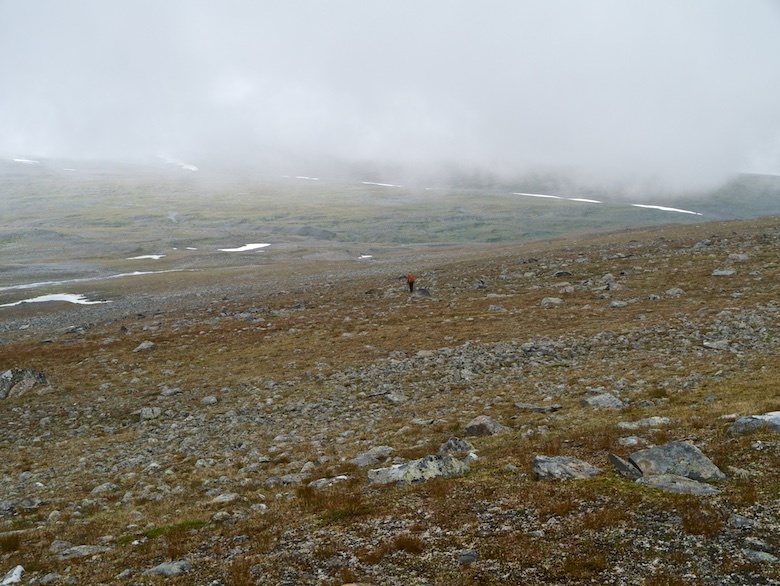 The initial climb was up slopes covered in dwarf willow, this was eventually replaced by grass as the hillside got steeper. We eventually got a glimpse of the snout of the huge glacier which was responsible for spawning the river we could not cross. The originally planned route involved crossing the Njoatsosvagge river and valley and climbing steep slopes to a lake high on a plateau. This lake Goabrekjavraj soon came into view and it was clear that it would have involved a bit of a slog to get up there. 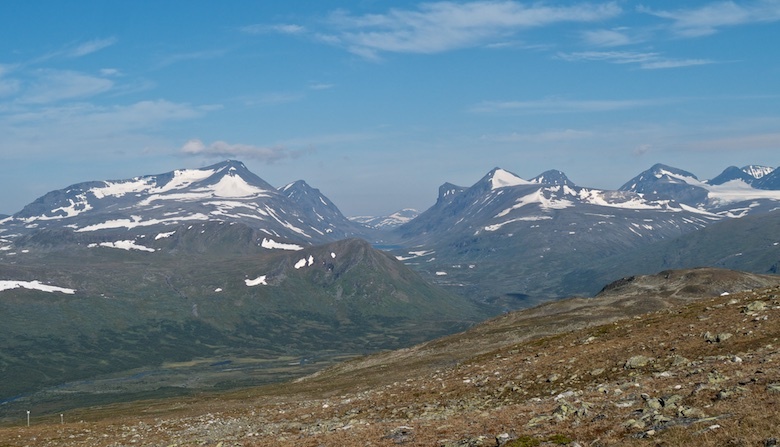 We were now on the far side of the mountain range that had originally dominated our view at the beginning of the trip. From the forest to the south they offer up their gentle side. From the north they are composed of fearsome pinnacles of rock and glaciers hanging at improbable angles from steep dark rock. From our lofty position I gazed into a long high level valley that runs parallel with the upper reaches of the Njoatsosvagge. 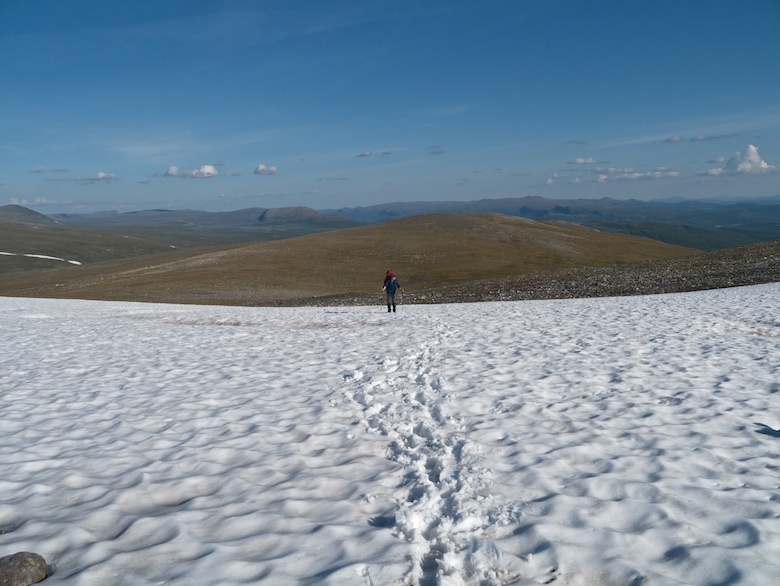 Late August and much of it was still covered with snow. 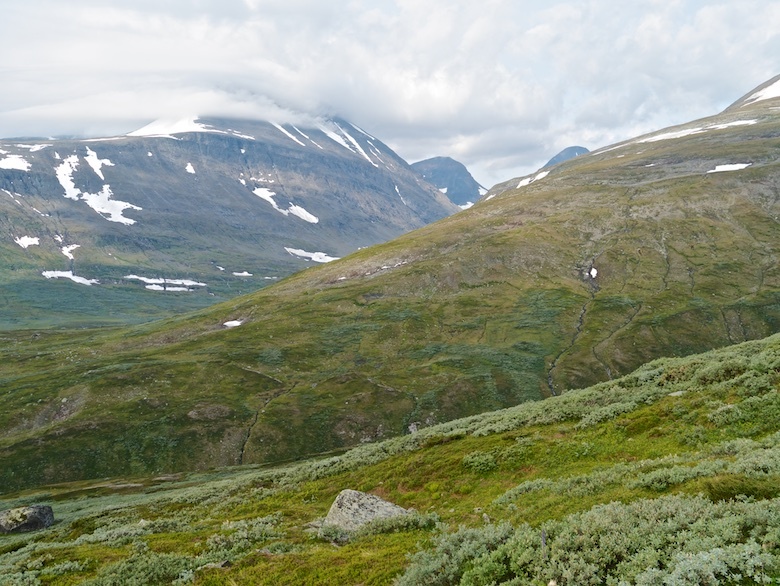 I imagine that it gives a wild and lonely through route to the north, perhaps one to try on my next trip back to Sarek. 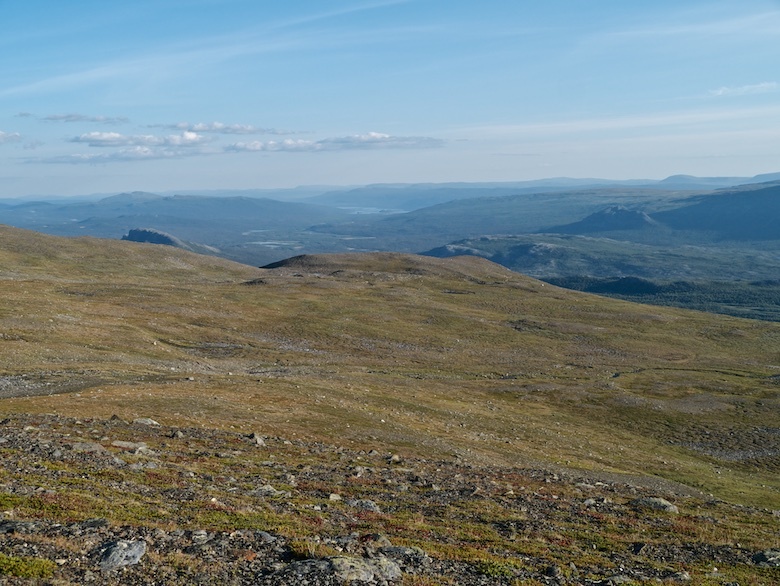 It was satisfying to sit on a mountain top at over 1300 metres whilst north of the Arctic circle. 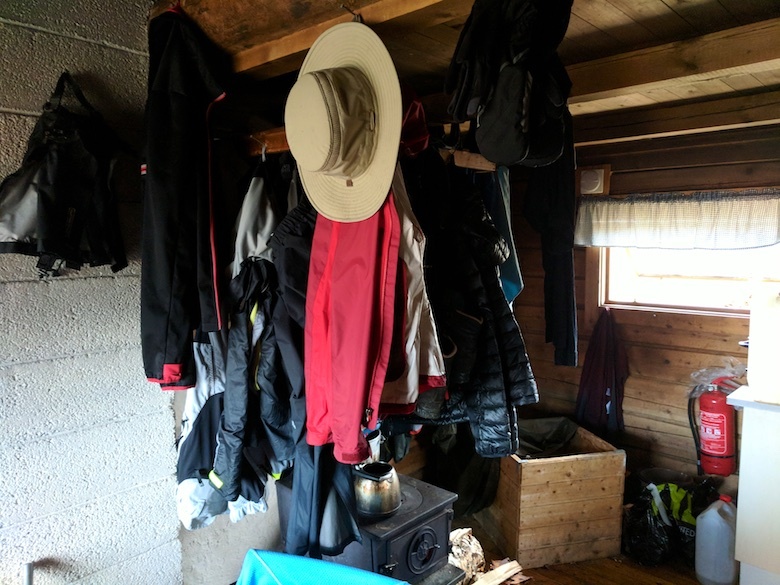 For the first time on the trip it was cool enough to pull on some warm clothing and there was not a mosquito to be seen. 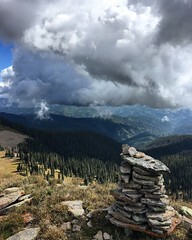 The weather was beginning to turn as forecasted, cloud bubbling up and covering the highest peaks. I have to say that the scale and majesty of the place was almost overwhelming. 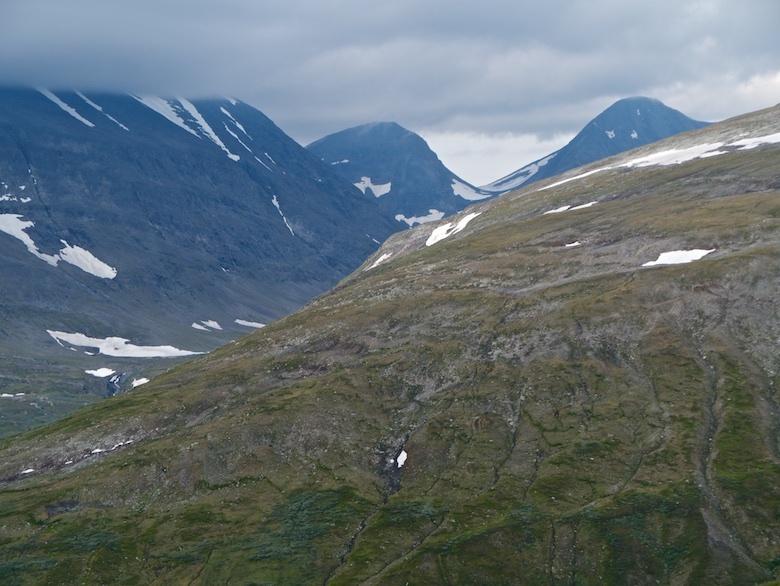 With cloud building over the dark jagged peaks there was a sense of menace in the air that I have not felt in Sarek before. It was clear that we were now in serious mountain territory, miles from civilisation and help if anything went wrong. 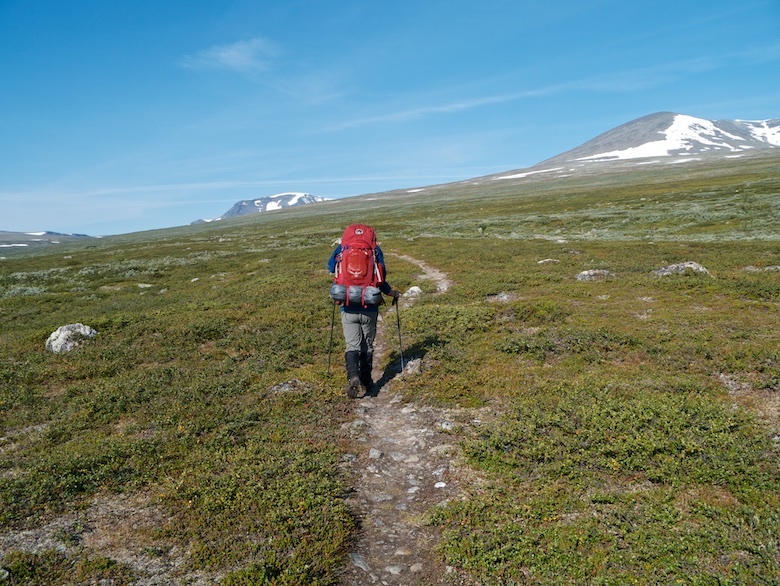 It was at least three to four days of walking to get to a road. A place to truly feel your own insignificance. 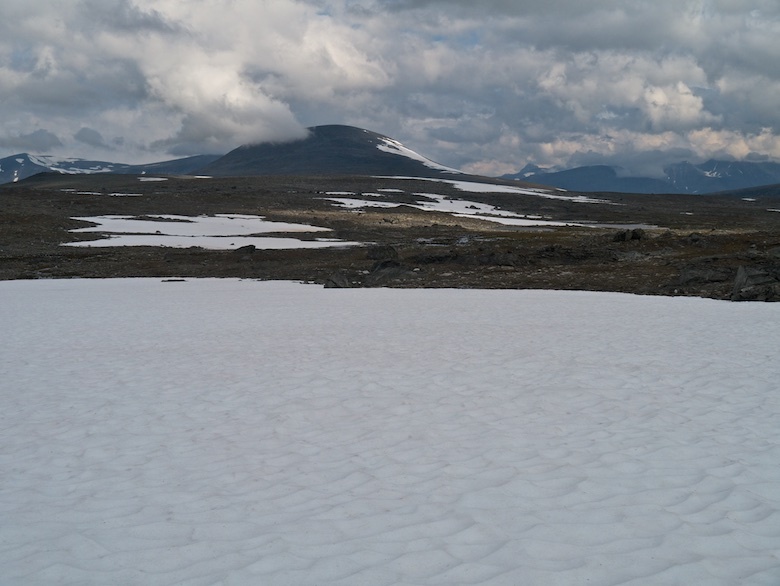 We would often find ourselves skirting large patches of snow, unsure of what was beneath them. Water was running everywhere and we were afraid of walking across a small hidden lake covered in soft snow. 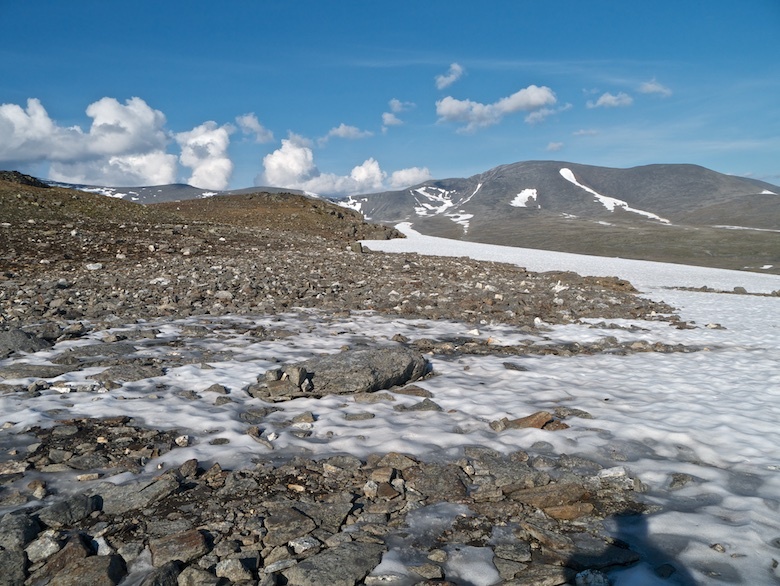 Bagatjavrasj is a large body of water which was mostly free from snow and ice. It was difficult however to tell how far the snow bank on the western side extended into the lake. 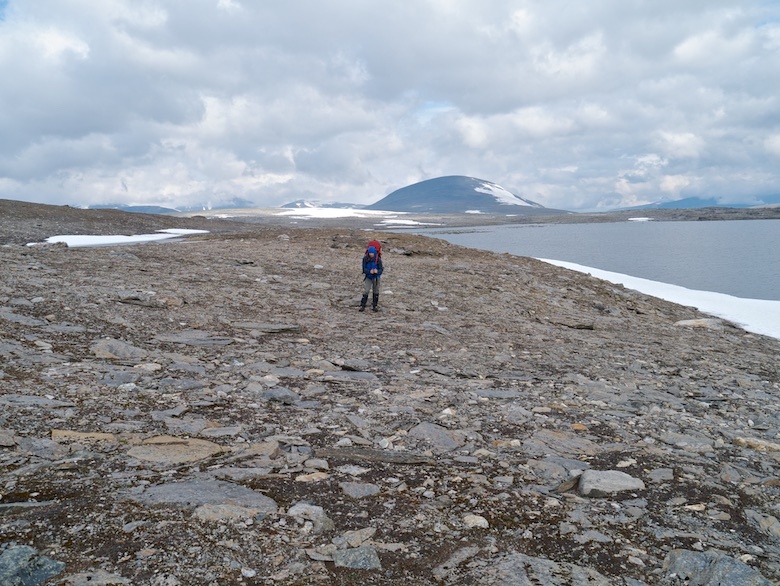 There were large sunken craters that indicated that much of it was not above dry land. We gave it a wide berth. As we got closer to the wall of mountains they took on a truly terrifying appearance. Climbing them would be well out of my league, at least without someone who really knew what they were doing. The pinnacle of rock above was mesmerising. 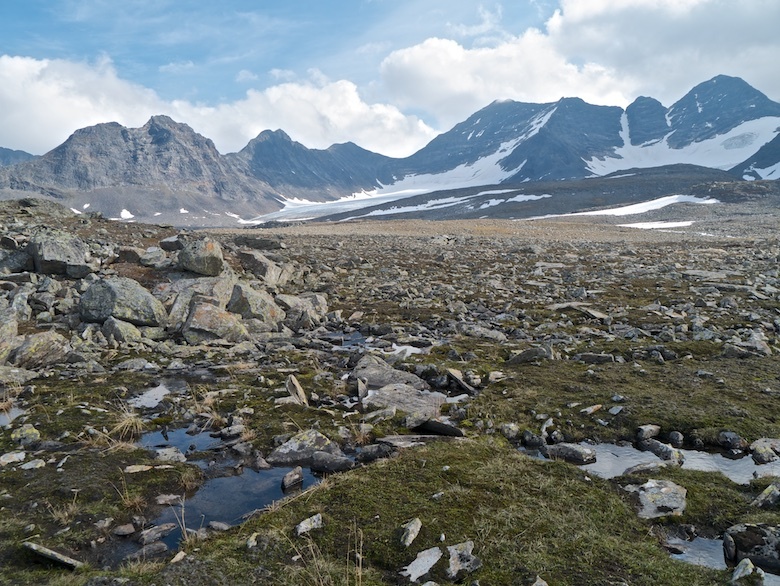 The vegetation was scarce, the ground covered by boulders and gravel, the odd patch of moss and lichen eking out a living. 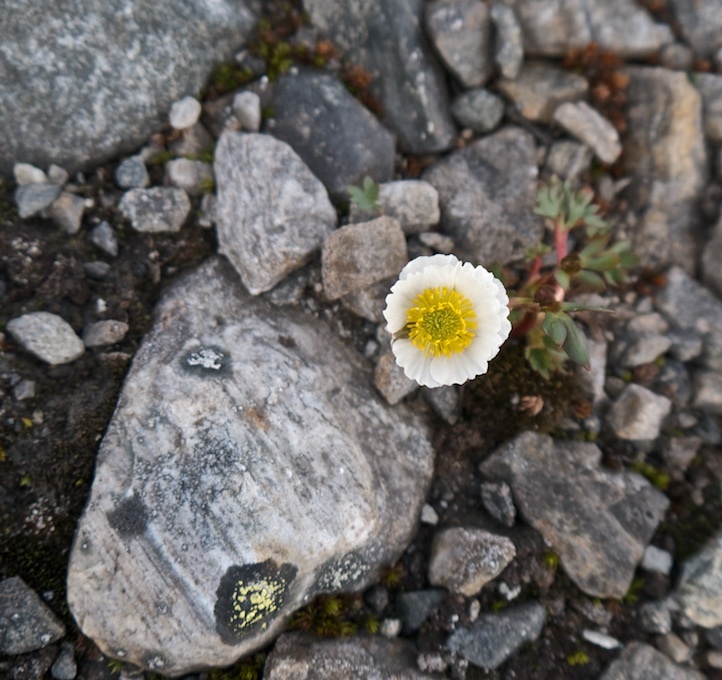 However even in such a brutal place there is beauty, tiny little flowers were thriving wherever they could find shelter. The outflow from the lake was surprisingly wide but thankfully shallow, we got across with dry feet after a large amount of rock hopping. We had probably the most spectacular lunch break of the whole trip. A rock bench next to the icy crystal clear waters as they rushed down the mountain. The sun was warm enough to remove boots and socks and dry them out a bit. I got my stove on and made noodles, a hot lunch always satisfying when out backpacking. Nothing can beat sitting in the sun eating a tasty lunch and looking at a view like this. We crossed another river and followed it downstream for a while. 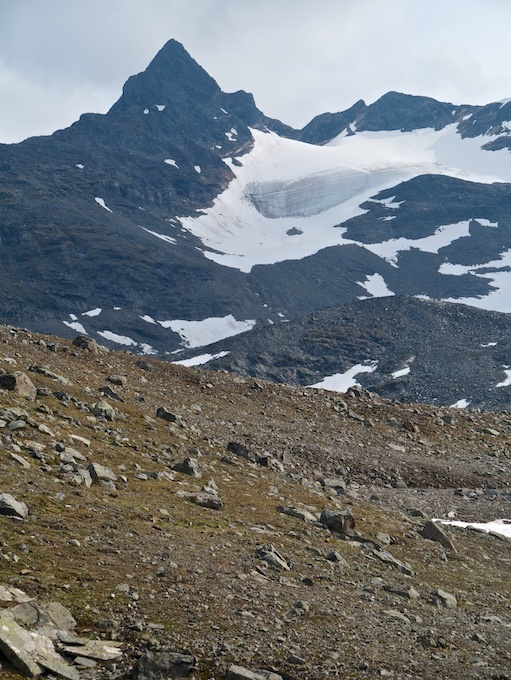 On slopes high above the far bank we spotted a group of backpackers make their way slowly across a snow field. They returned our waves and soon disappeared amongst the rocks of the endless plateau. 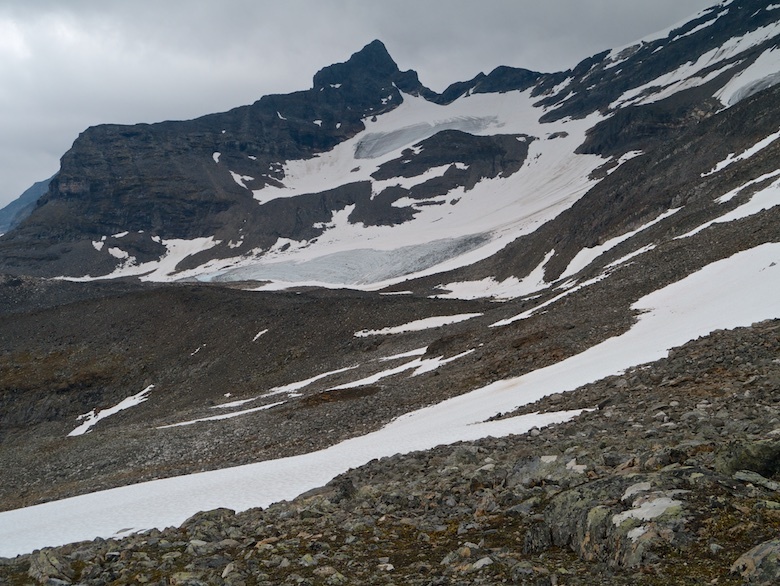 Glacial moraines towered above us, their slopes steep and loose. It took a bit of effort for our tired bodies to make the climb. Gaining height the plateau behind made us feel like specks of dust on the landscape. 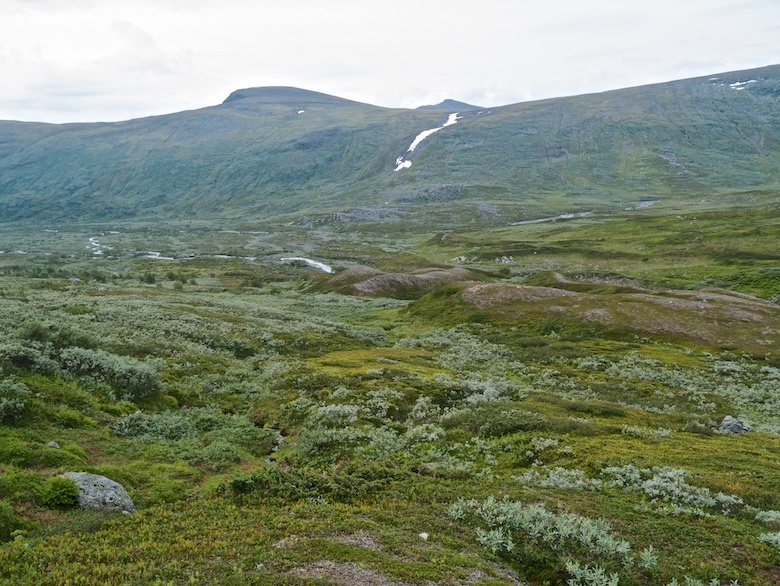 Gently rolling rocky hummocks as far as the eye can see. A vast desert reaching to further snow capped mountains. It was good knowing that there are small signs of life in the shape of tiny flowers in an otherwise alien land. 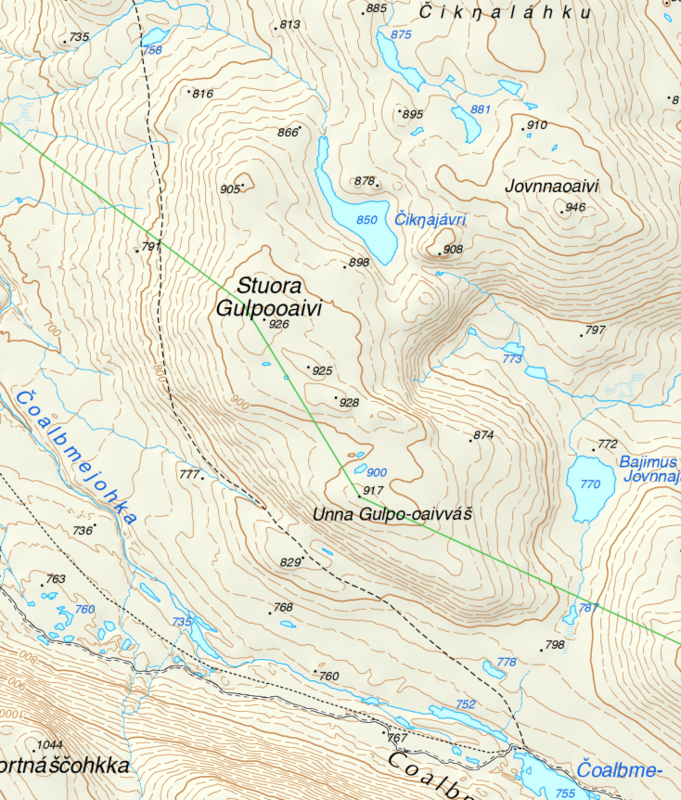 Our route took us along a wide rocky shelf, steep slopes above and below. 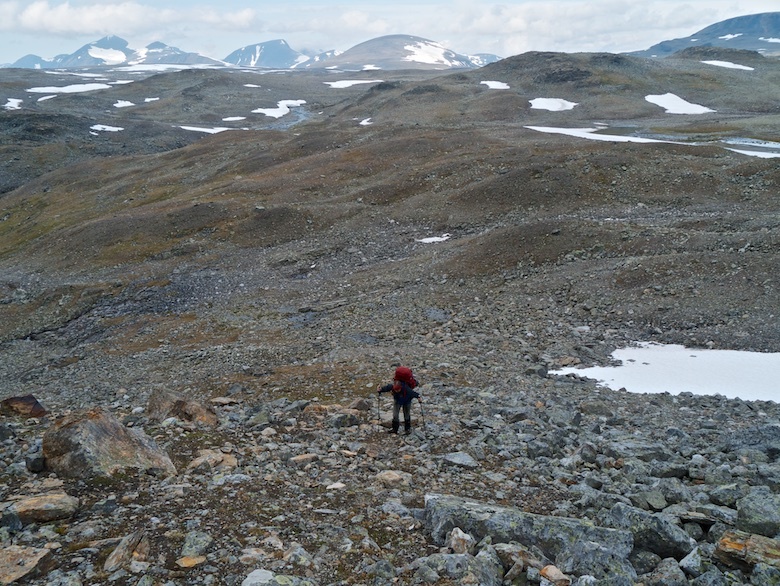 We entered a large boulder field of unstable rocks, each one wobbling underfoot as we took a step. Progress was slow and tiring, a slip would mean both pain and disaster. I was glad that I had good old fashioned leather boots on my feet. I don’t think I could have made it across in trail shoes. 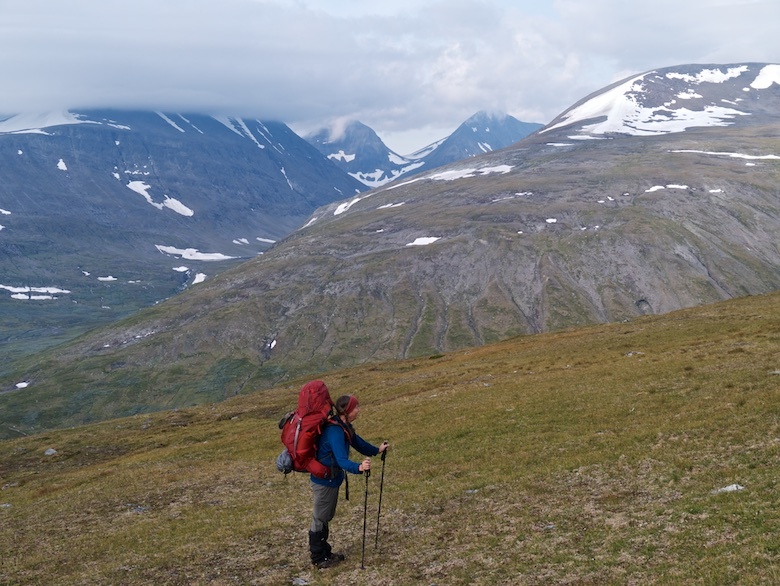 After what felt like hours we descended steeply and sighed with relief when we felt grass beneath our feet. 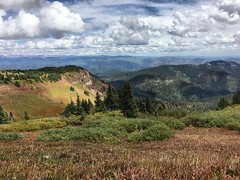 We could relax for a couple of miles of relatively easy walking above a series of deeply incised spurs that jut out above the valley below. The cloud was sinking ever lower through what had become early evening. Every now and again we would be enveloped in mist and a few spots of rain began to fall. We pulled on our waterproofs for the first time in five days, not bad for Sarek which has a reputation of being wet. 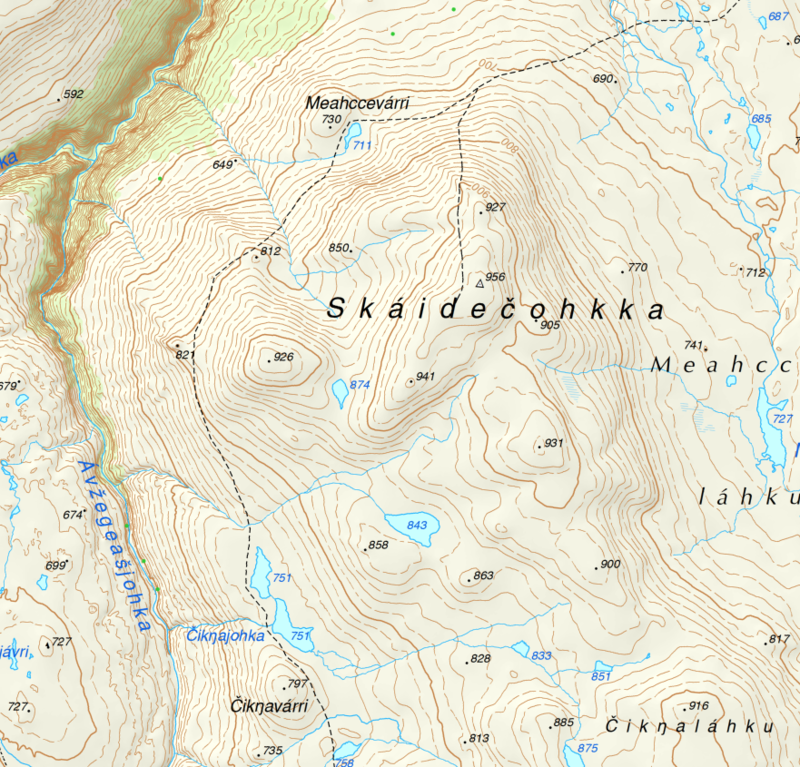 I was not one hundred percent sure about the planned descent into the gorge of the Ruopsokjahka, the map was not giving much away. All I knew was that it would be steep. Some Jedi map reading meant that we managed to descend into the only section that did not have cliffs or near vertical walls of vegetation. The skies opened, heavy rain making everything slippery just at the wrong moment. 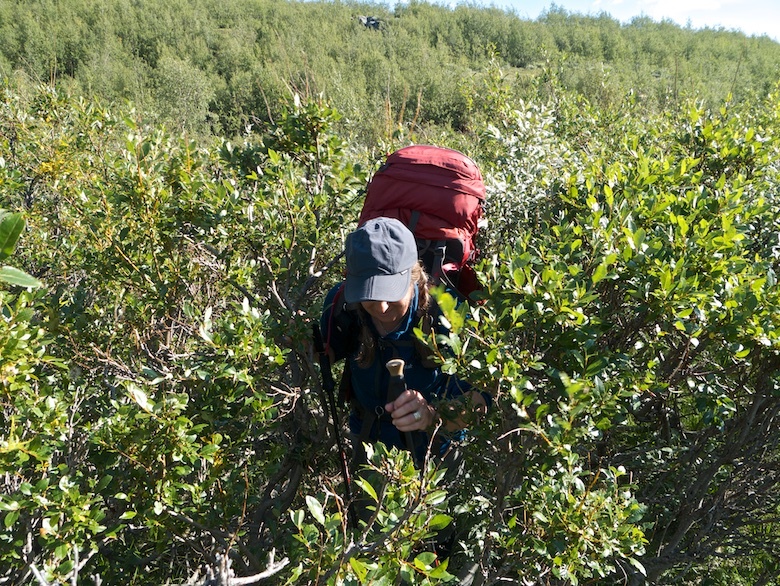 We got across the river and pulled ourself up through sopping wet Dwarf willow on the other side. At the first flat bit of ground we got the tents pitched. After more than twelve hours on the go we were wet and tired. Wind whipped over our exposed spot, ragged clouds drifting not that far above us. 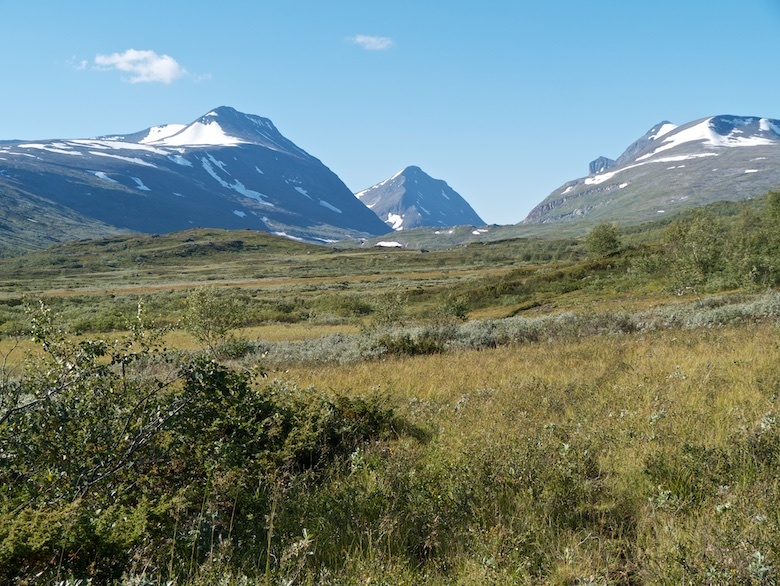 Summer in Sarek had ended. 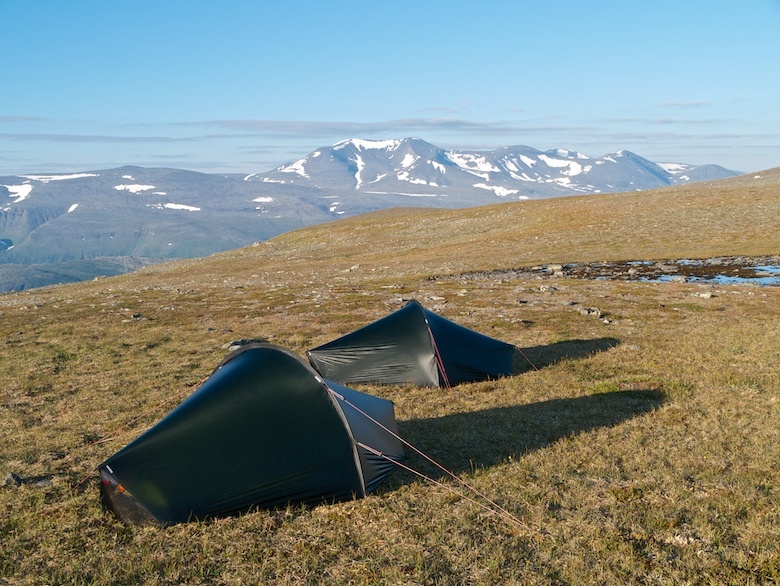 Sadly there were no reindeer to be seen when I emerged from my tent under yet another clear blue sky. 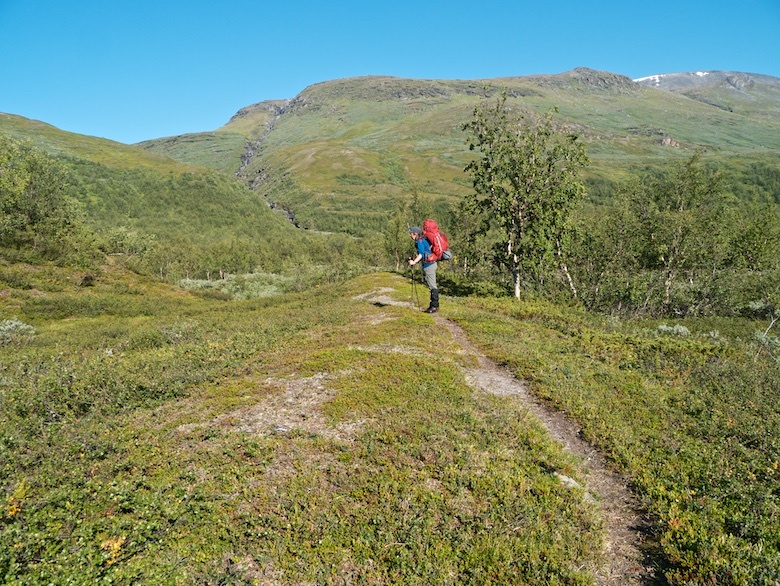 It was looking like it would be another hot and uncomfortable day, especially seeing that we would be descending into a deep valley to make battle with the legendary dwarf willow. I had brought clothing that I thought would be suitable for the Arctic, little did I realise that my Merino base layer would prove uncomfortably hot. To save weight I had taken one set of clothing for walking and another for wearing in the tent. We were both prepared for wind and rain and temperatures in single digits. 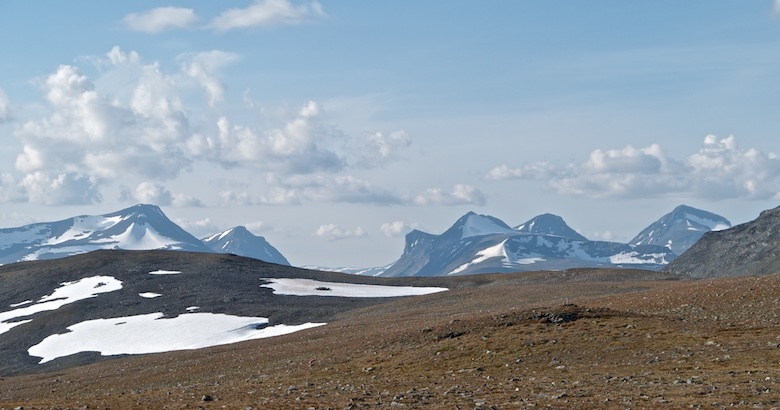 I know that it sounds like I am complaining about sun and blue skies, however I am aware of just how incredibly lucky we were to see Sarek under such superb conditions. Anyway who can complain about waking up somewhere like this? 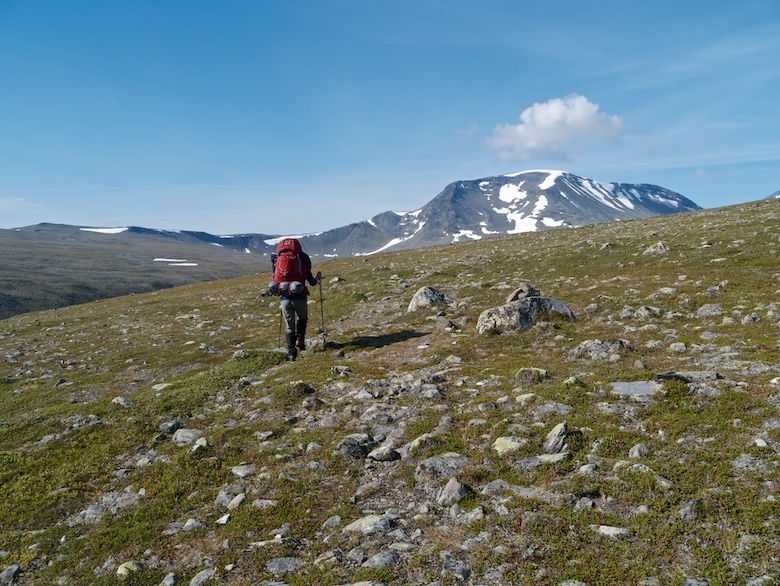 After packing the tents we crossed the upland bowl, climbing onto another wide ridge. The view that greeted us to the north-east was mind blowing. 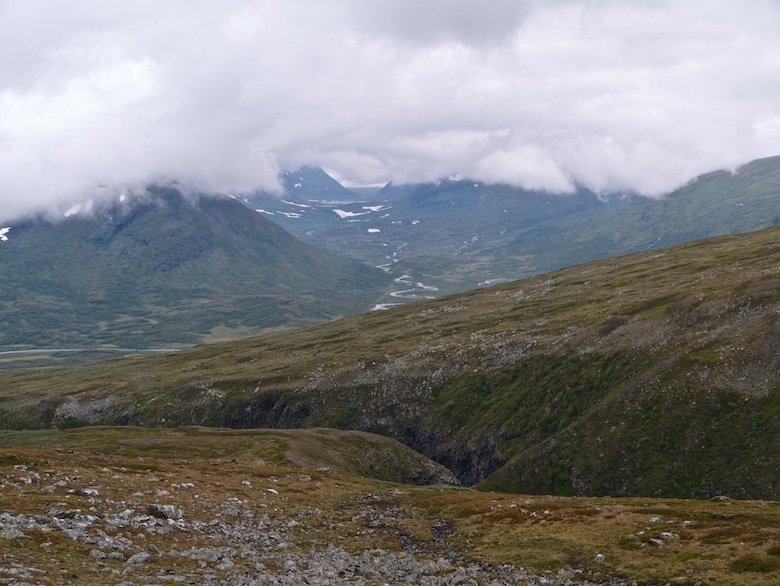 Below us was the wide basin of the Njoastsosvagge which we would be walking later that day. 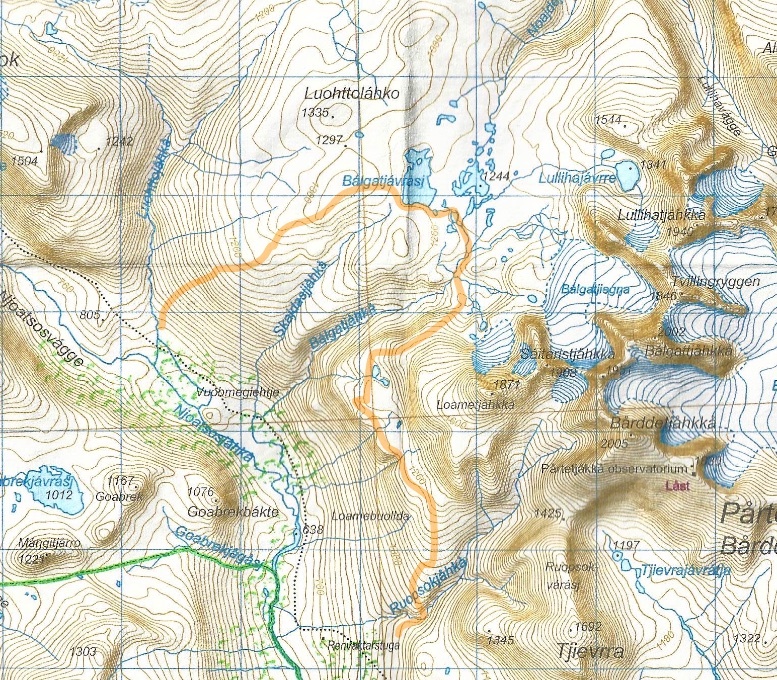 This curves round to two high lakes crowded by jagged glacier covered mountains. The view was so good that I thought that I should present it to you twice. 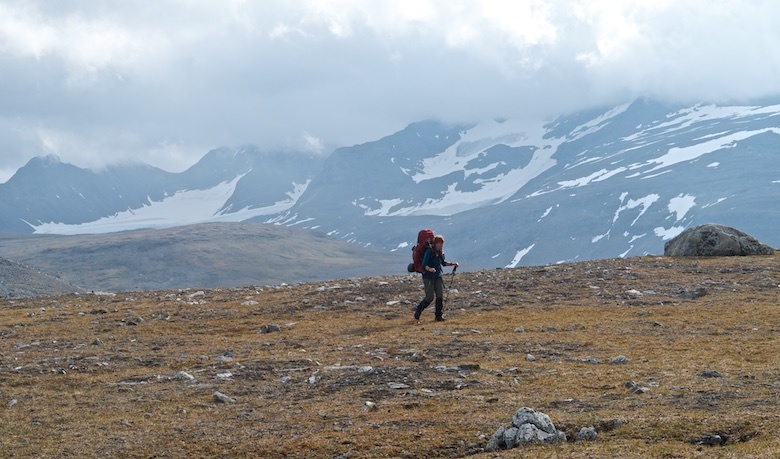 It was one of the most impressive places that I have ever backpacked, only being surpassed the following day when we got higher and closer to the big peaks. Above us an enormous fin of rock rose sheer into the blue sky. 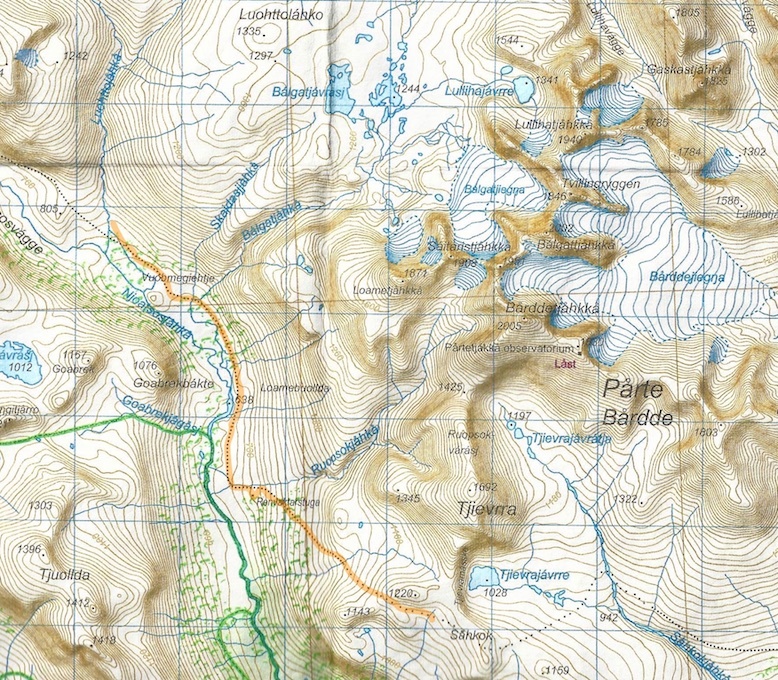 It was difficult to pin point exactly which mountain it was on our map as most of it was hidden by the bulk of other mountains. It is on the right of the photograph below. Route finding during the end of the previous day and the start of this was simplified by the line of metal posts that ran parallel to the narrow path. We pondered their use, coming to the conclusion that they would have something to do with the Sami who work the land and farm reindeer here. On the descent into the Njoastsosvagge the posts and path diverge, we had to keep a keen eye out for the path which would become indistinct amongst the vegetation. The scale of the Njoastsosvagge increased the lower we got, it truly is a wild place. 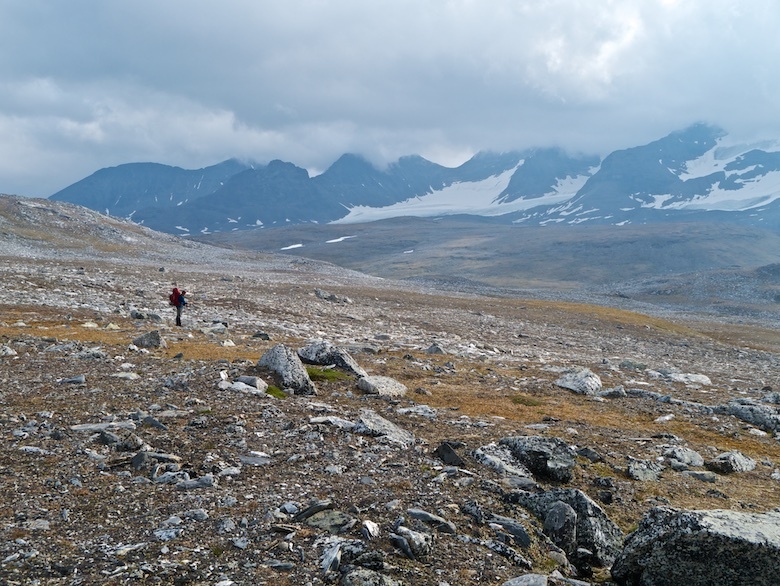 Having experience of walking through valleys in Sarek I had a good idea what was coming. Close to the valley bottom the path comes close to a locked hut. 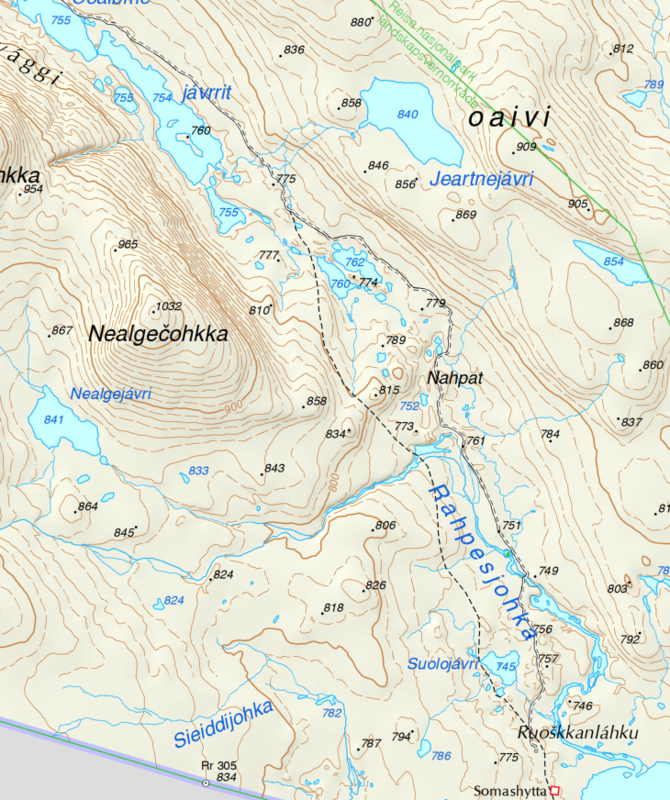 It is marked Renvaktarstuga on the map, my powers of deduction coming to the conclusion that it is used by the local Sami in relation to reindeer. 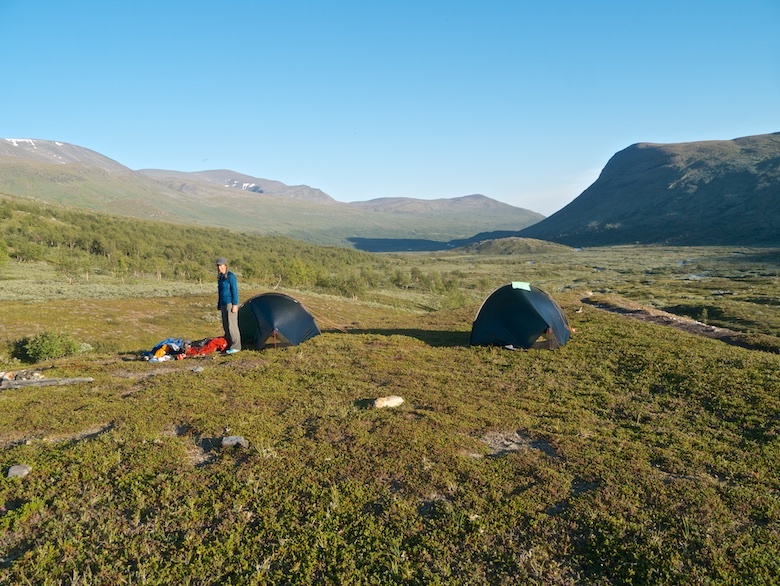 We had planned to pitch there the night before, the surrounding area having several possible camping spots. I had read that the river Ruopsokjahka can be tricky to cross. Its water was thankfully low and I managed to get across dry shod and without removing my boots. Just prior to the crossing we passed three young giants, all sporting massive packs, long beards and wooden staffs that would make Gandalf envious. After the river crossing we managed to pick up a well-worn path for a while, giving us a false sense of security. Before we knew it the way forward looked like this. 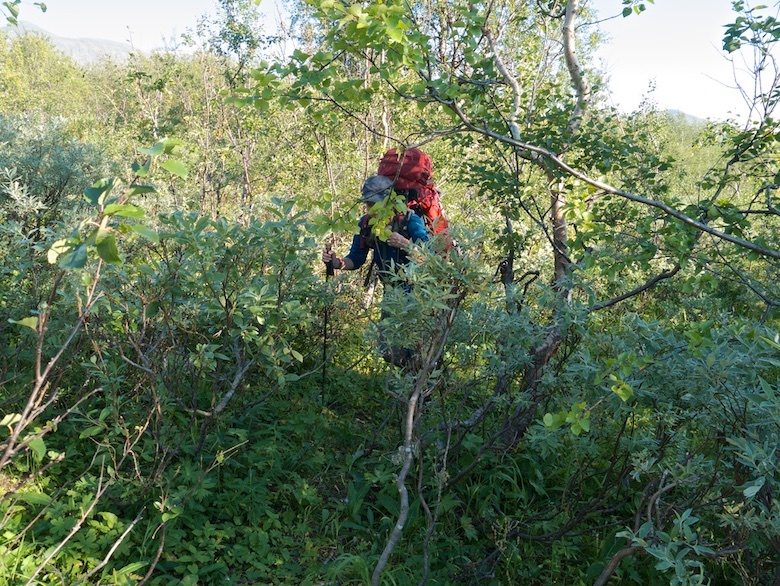 The next few hours was a battle with head high dwarf willow and rucksack grabbing birch. 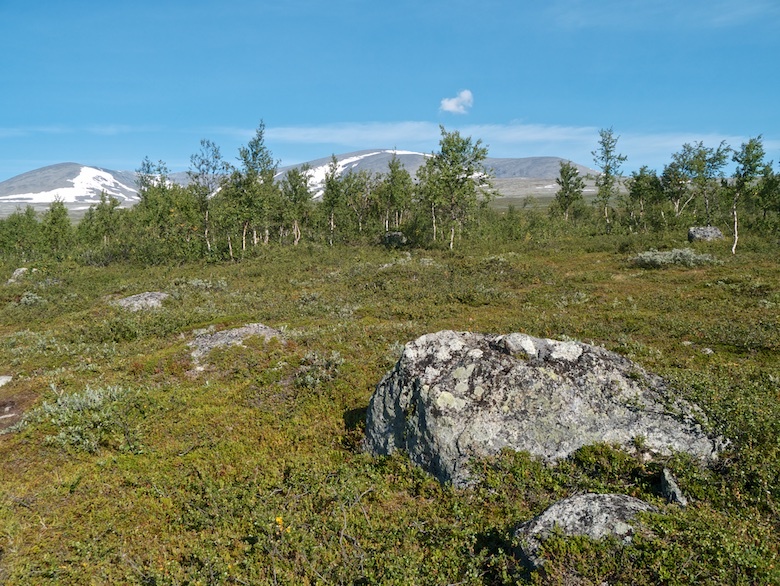 It was all rather exhausting, compounded by the fact that dwarf willow likes to grow in really boggy areas. Whilst we were fighting the green leafed monsters the bogs were trying to remove our boots. The mosquitoes buzzed in our ears whilst the large horseflies attacked us with stealth. 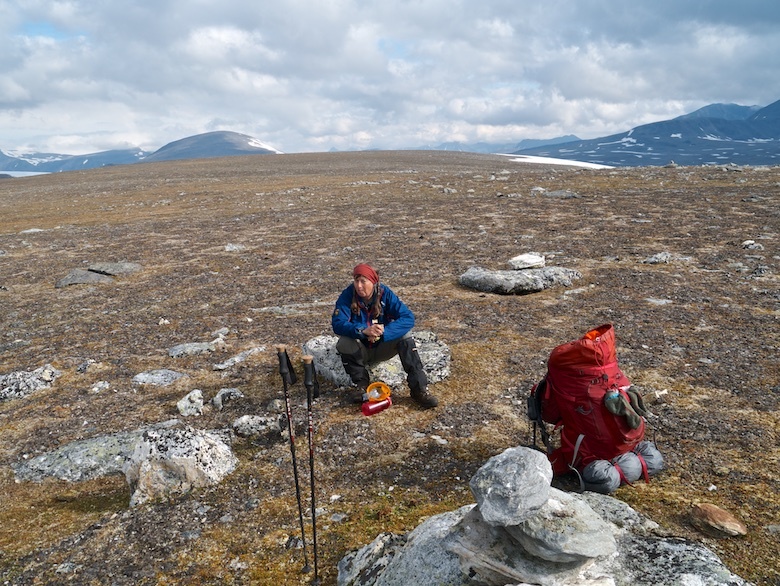 Thankfully there were open areas, an opportunity to make forward progress and take time to enjoy the surrounding mountains. 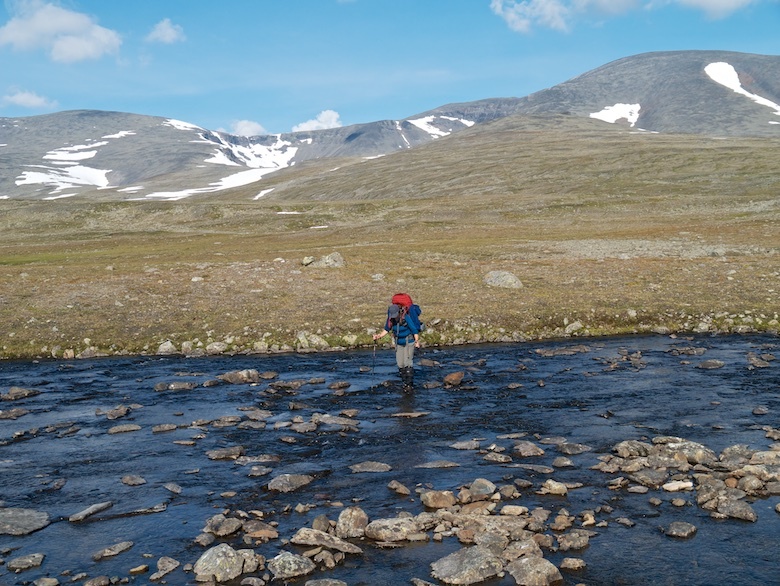 The first testing river crossing of the trip was where the Balgatjahka meets the Skajdasjjahke. 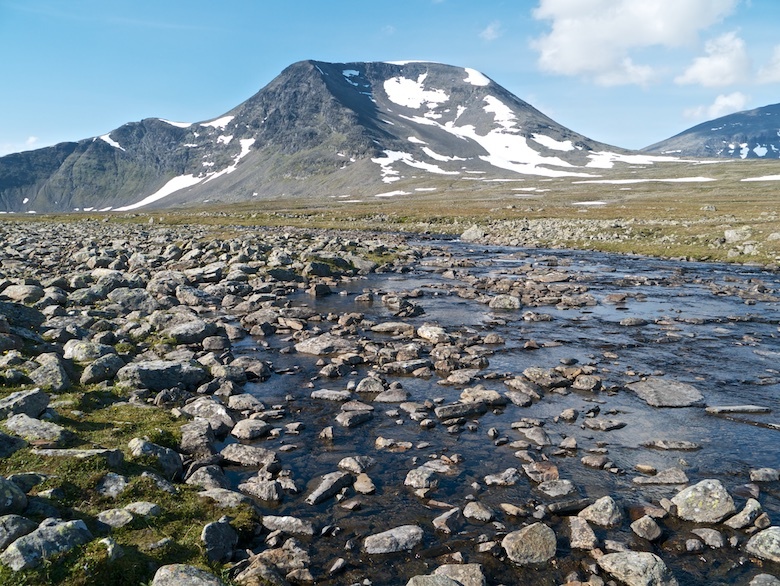 The river comes from both lakes and glaciers on the mountain plateau above. 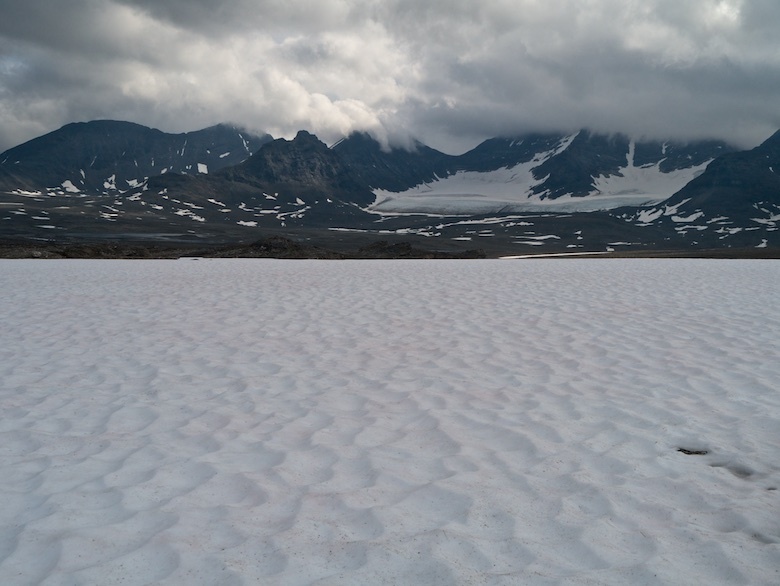 This means that it has a blue milky hue due to the glacial sediment. It was running pretty swiftly but there were sections where the water was calmer. We linked arms and crossed together, both of us soon regretting not removing our trousers. It was deeper than it looked, the water coming to the bottom of my boxers. The water once again was very cold! On the far bank we put modesty aside and stripped to our underwear, trousers being draped over bushes to dry in the sun. We were glad of the good weather as it would have been a miserable experience if it had been cold and raining. The sun worked its magic and we were soon on our way wearing dry trousers. 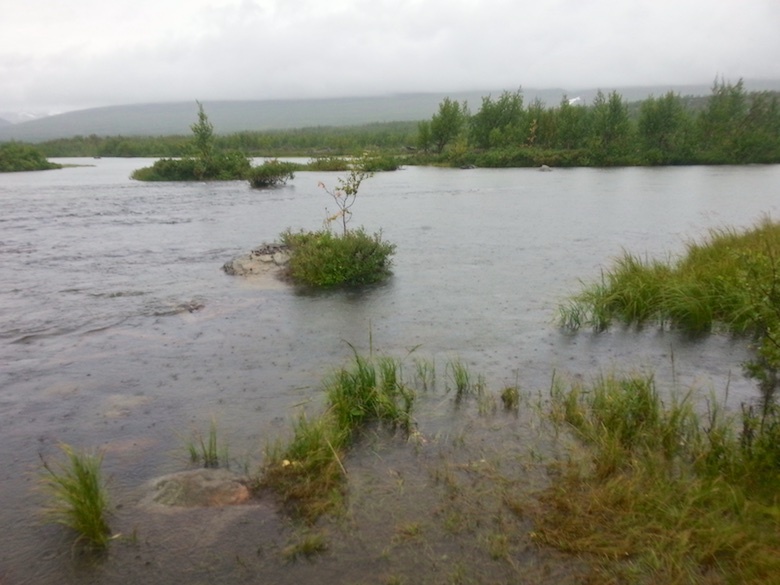 We heard the Luohttojahka long before we saw it, the rushing water being hidden by the surrounding dwarf willow. I think that all the colour drained from Chrissie’s cheeks when she finally saw it. 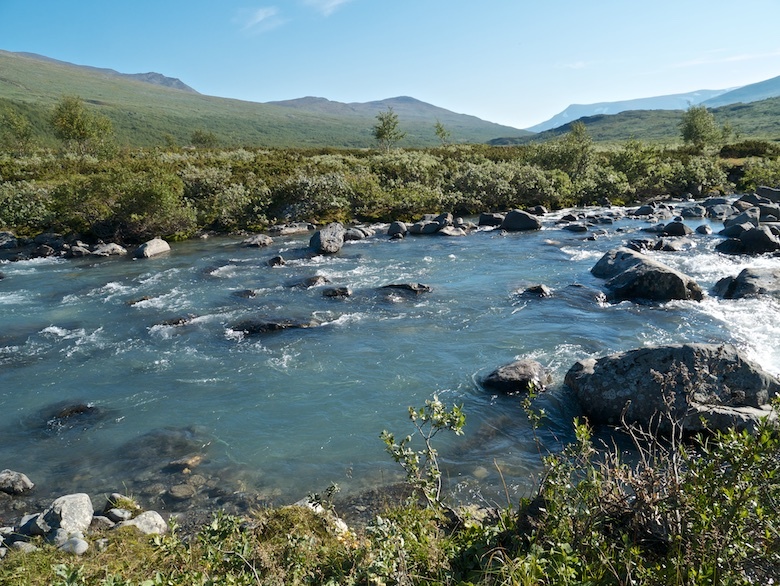 A great volume of milky white water was rushing at speed through the narrow confines of the river bed. 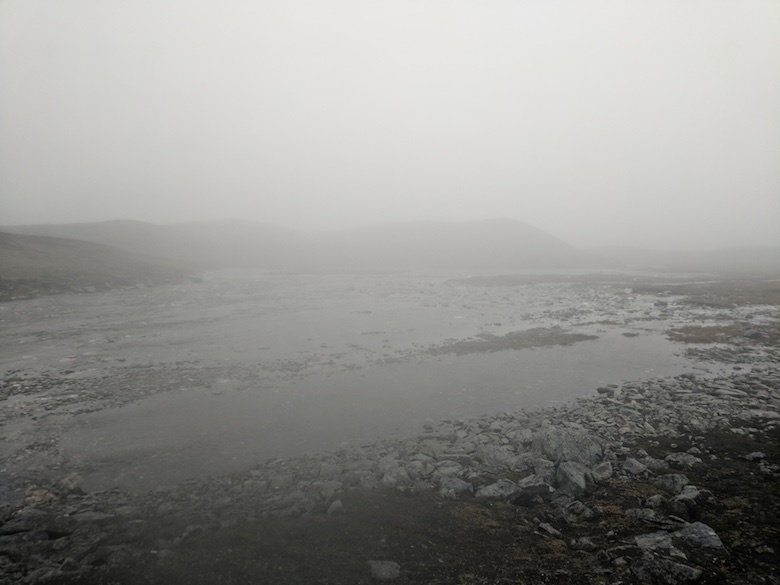 This was a full on glacier fed river, totally opaque, the bottom not visible. 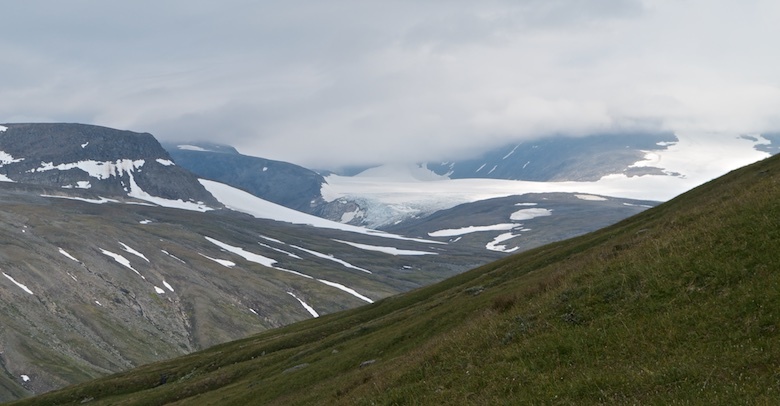 The heat of the previous few days had obviously made a dent in the large glacier above. 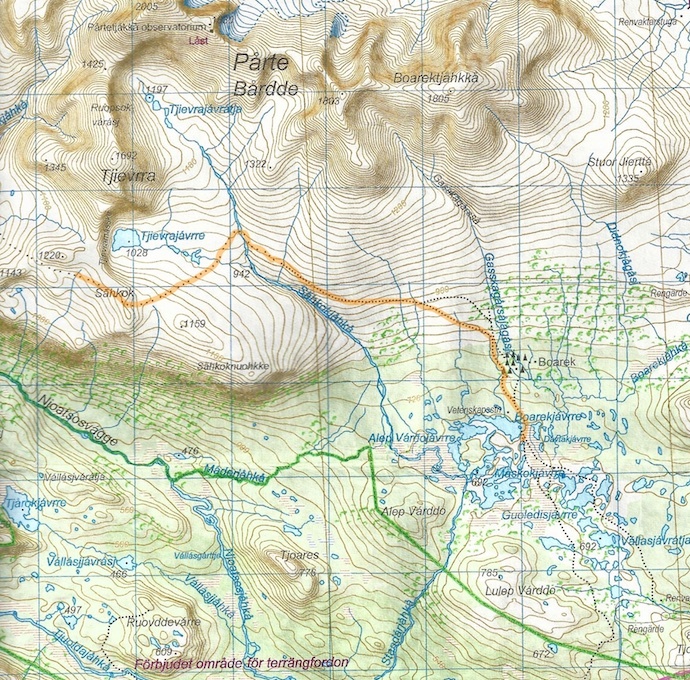 I dumped my pack, changed into my river crossing shoes and removed my trousers in preparation for a solo test crossing. I got about a third of the way across, the water at mid-thigh proving far too strong a current to progress any further. It was also impossible to gauge how much deeper it would become. The risk of being swept away was far too great so I made a hasty retreat. I tried to cross at a couple more places downstream where the river was a little wider, but the current was still far too strong. Our path was effectively blocked that afternoon. 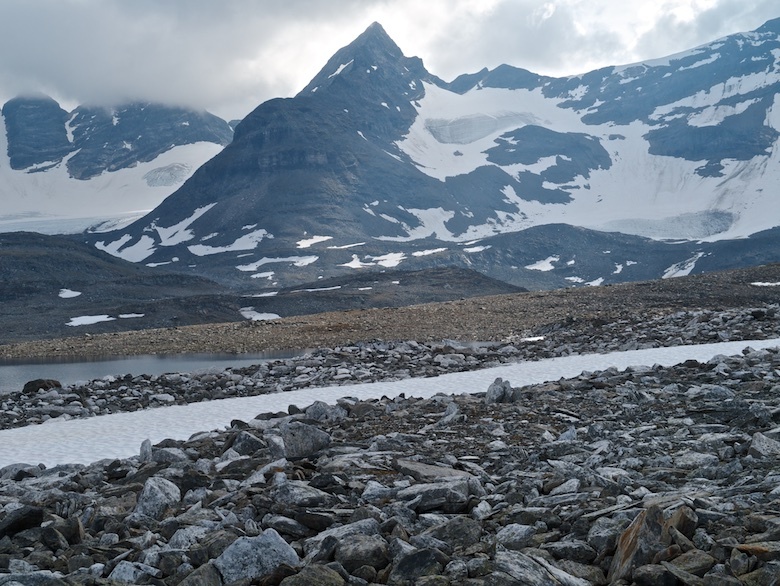 I was hopeful that if the night was cool enough the water levels might drop due to most of the water coming from a glacier above the 1300 metre contour. If we got up early enough we might just get across. 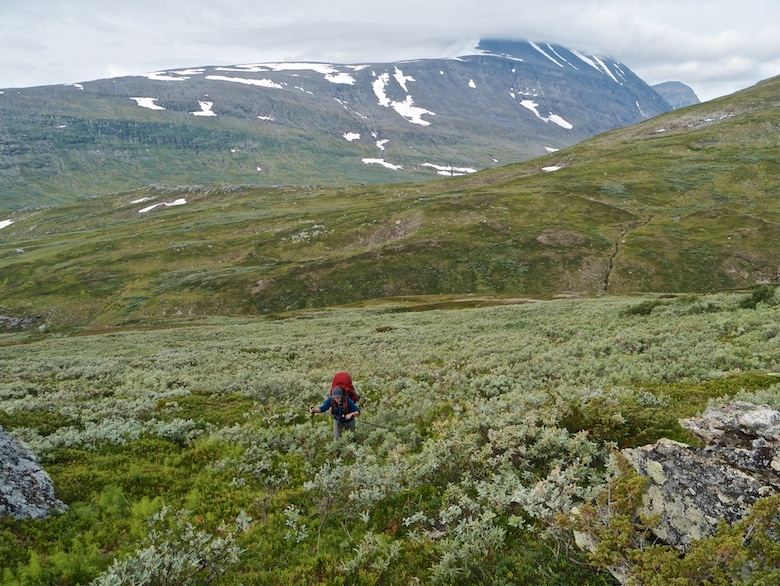 The alternative was to walk back the way we had come but there was no way I wanted to battle the dwarf willow again. 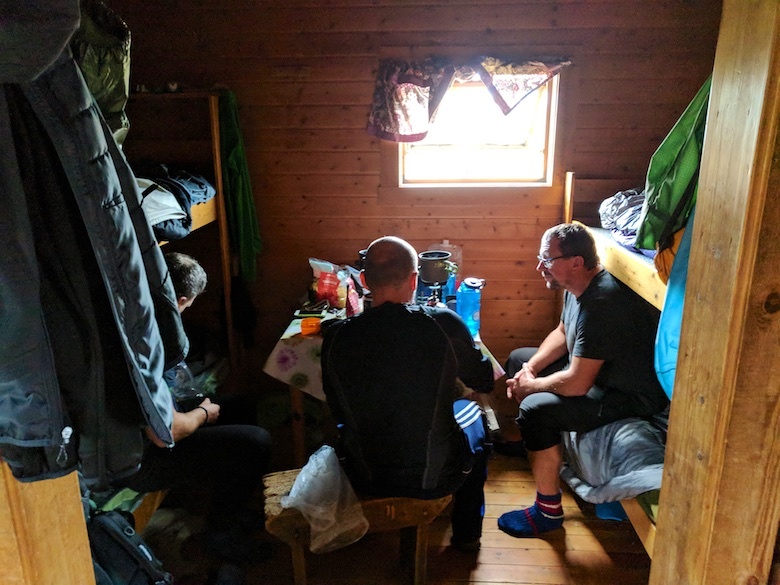 There was one other possibility, but that would involve a long hard mountain day crossing giant boulder fields and traversing steep slopes below glaciers. I went to bed pouring over a rather inadequate 1:100k map. Here’s a short video showing the river we could not cross along with that nights camp. I woke in the middle of the night feeling hot, sweaty and trapped. I fought my way out of my sleeping bag, got the door open and spent a couple of minutes on my hands and knees being sick. I think that the heat of the previous day along with a couple of days travelling had taken its toll on my system. Luckily that was the only time during the trip that I was sick, so probably not a bug. I felt much better when I emerged from the Enan at 7.00am into a bright warm morning. 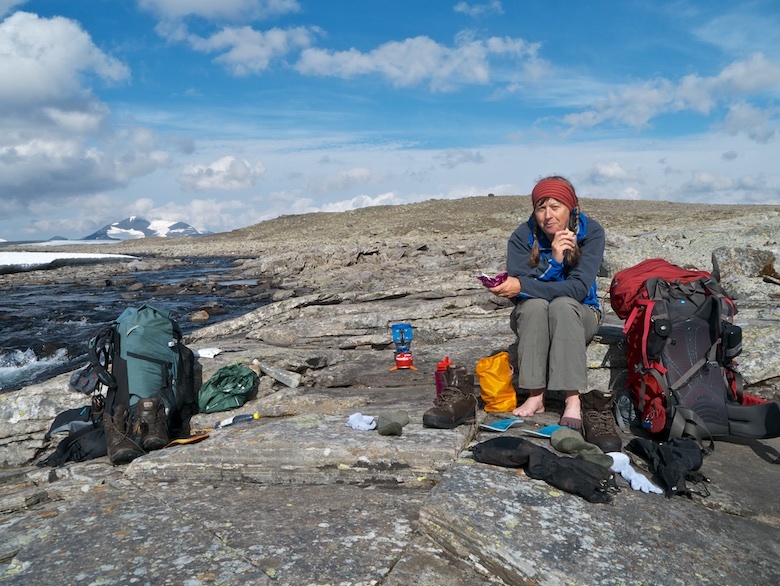 Chrissie was already up and about, sitting on a rock next to her tent, cup of tea in her hands. 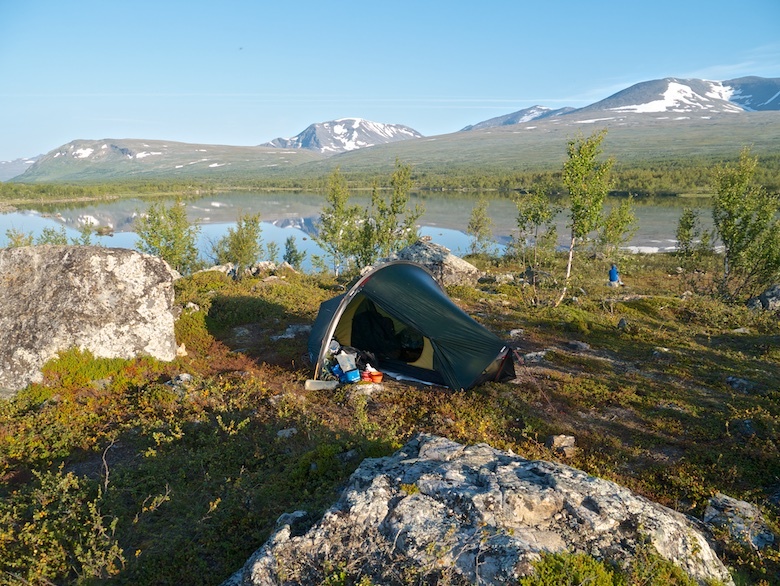 Despite the less than ideal ground conditions on which to pitch (lumpy, rocky, prickly vegetation) you can’t ask for a more idyllic location. After stopping short the day before we were packed and away by 8.30am to walk the short distance to the first river crossing of the trip. 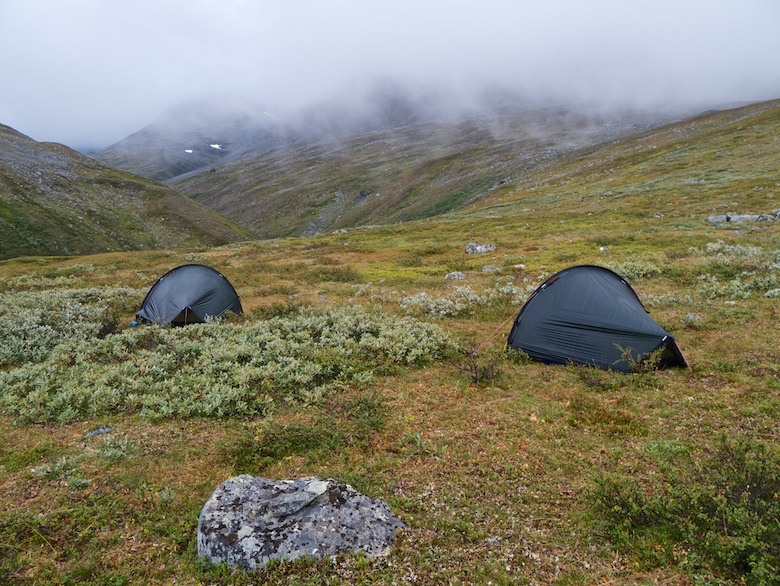 I was aware of its sound during the night, the noise seemingly amplified as I lay in my tent. Although wide it was a perfect introduction to river crossings for Chrissie who admitted that the prospect of some of the rivers made her nervous. She decided to keep her boots and gaiters on whilst I changed into the Inov-8 Recolite 180’s brought along specifically to cross rivers. This one is about a hundred metres from bank to bank, joining two lakes. This meant that the water was calm, especially after a week of hot and sunny weather. A series of wooden triangles built up on stones show the best way across. The water barely came to mid calf, although by the time I had crossed my feet were numb with the cold! As I was changing back into warm fluffy socks and dry boots Chrissie decided that in future she would remove her inner soles and save a pair of socks specifically for crossing rivers. 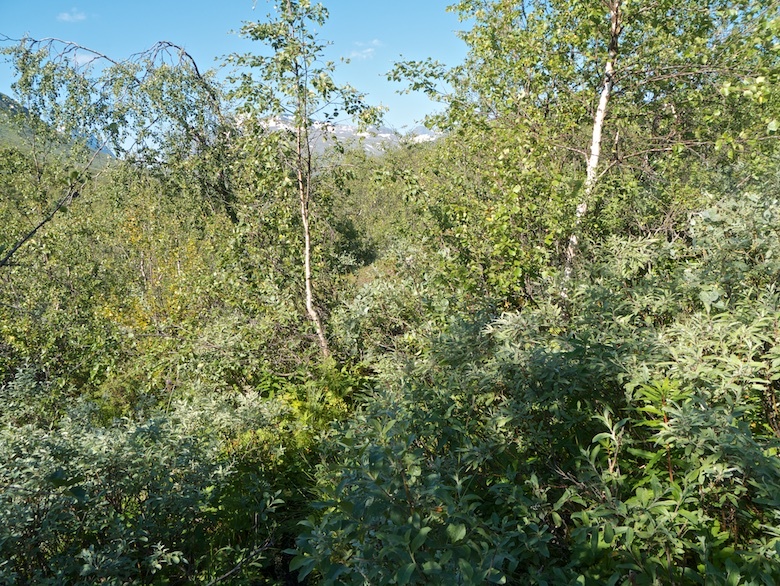 The good path continued on the other side, climbing up through a dense forest of birch, duckboards once again giving easy passage across the boggy stretches. 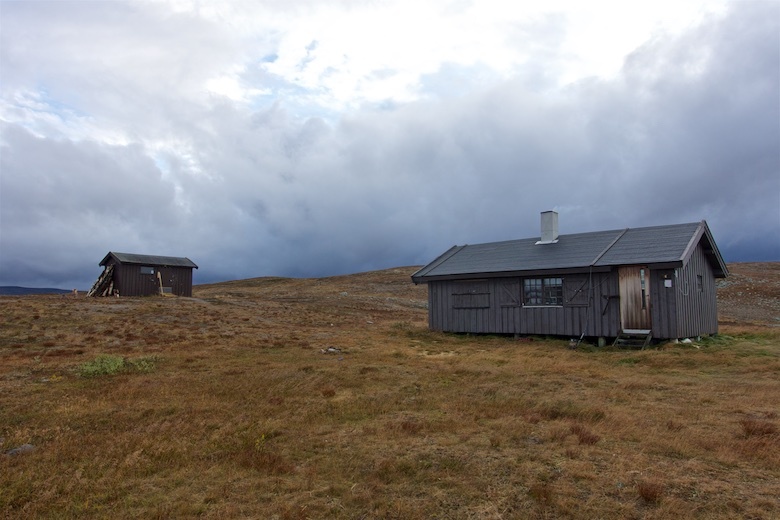 We had hoped to see the huts at the Sami settlement of Parek but the path veered too far to the left and we decided not to do a detour. 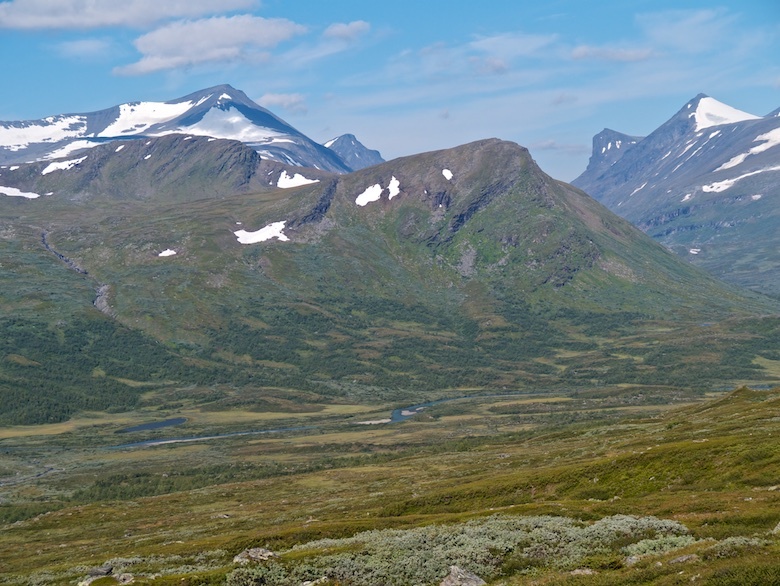 Soon we were leaving the forest behind, the birch trees thinning out and the mountains rising above us. 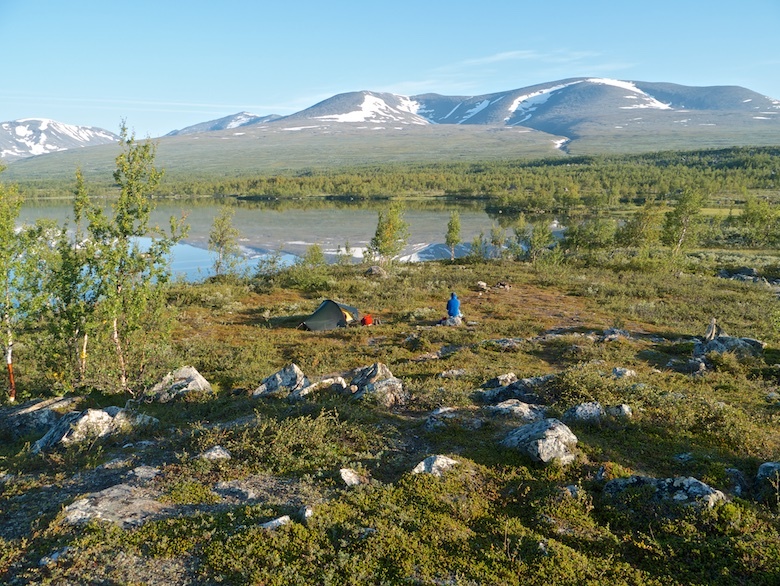 A handy boulder gave a good spot in which to sit and snack whilst swatting at the mosquitoes. We thought that they had disappeared whilst walking through the forest but they came back with a vengeance as soon as we stopped moving. Leaving the last of the trees behind there was a real feeling of entering a mountain landscape. 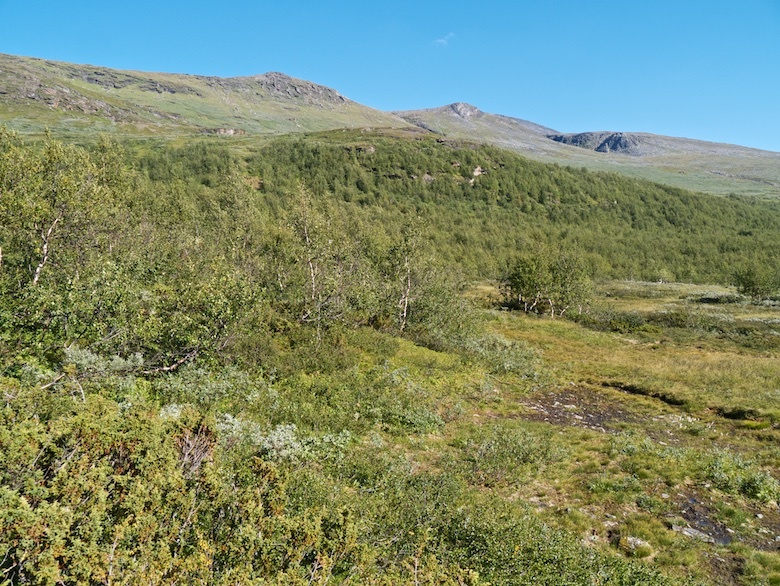 The path which initially is very clear climbs across vast moorland slopes, the vegetation growing closer to the ground, even the dwarf willow being no more than knee height. Unfortunately with the heat the views to the south were very hazy. 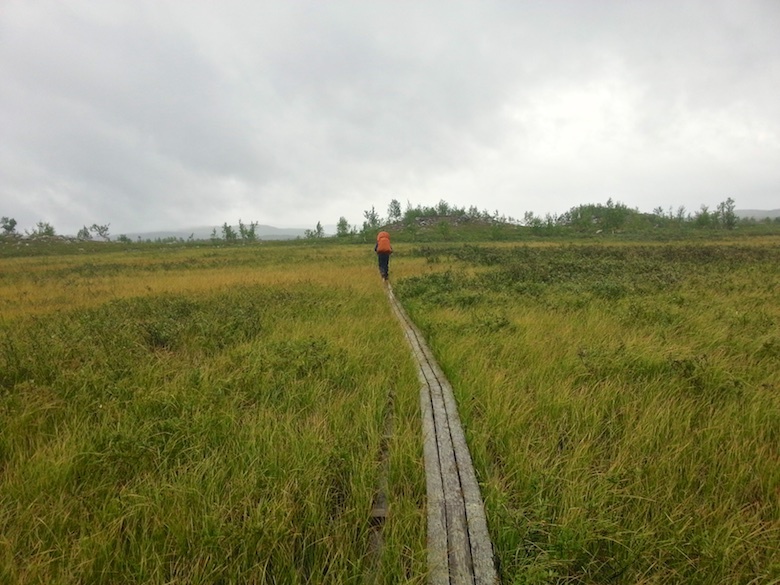 We still got a sense of the scale of the Parek bog that we had crossed, numerous lakes interspersed with forest and marsh. The higher we got the more intermittent the path, often disappearing amongst the boggier sections. Above 900 metres it changed direction to contour high above the Sahkokjahka river, heard but unseen deep in the valley below. We would have to cross it higher up, the German we met the day before warning us of its difficulty. ‘It’s a white water river’ he told us several times. The look on Chrissies face at the time suggested that she was not thrilled with that prospect. Further on a side stream was completely buried under snow, still solid despite the hot sun, the kicking of steps a change of rhythm. 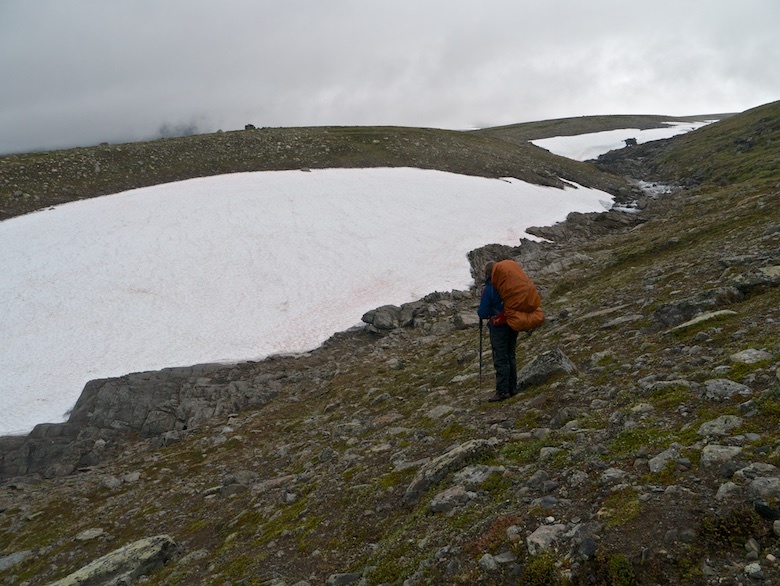 We approached the Sahkokjahka at the point in which it was covered by a huge snow bridge. We could see water disappearing under it, the exit end fractured, car sized chunks of snow ready to break off. We crossed together, the exit steep and needing good steps kicking in to get to the solid ground above. 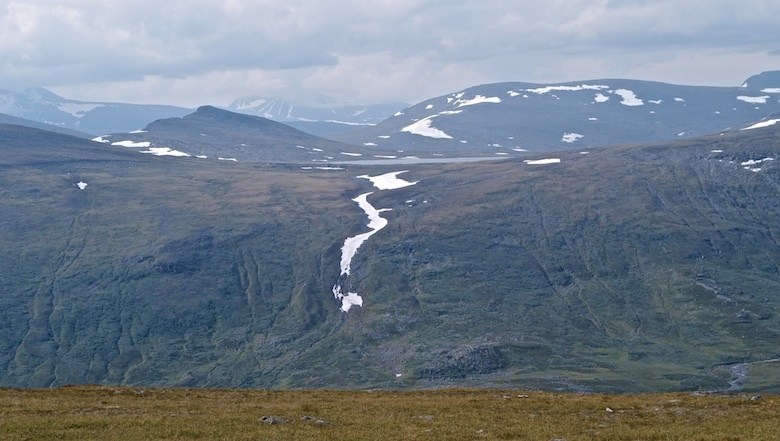 The high plateau we then crossed was very reminiscent of the Cairngorms. 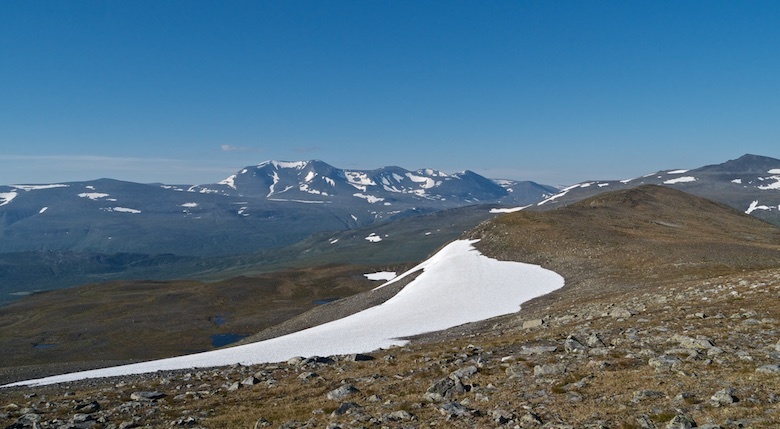 I looked back at the 2000 metre mountains behind us, picking out what looked like climbable routes to their summits. I could even make out the tiny red dot of the observation hut near one of the tops. 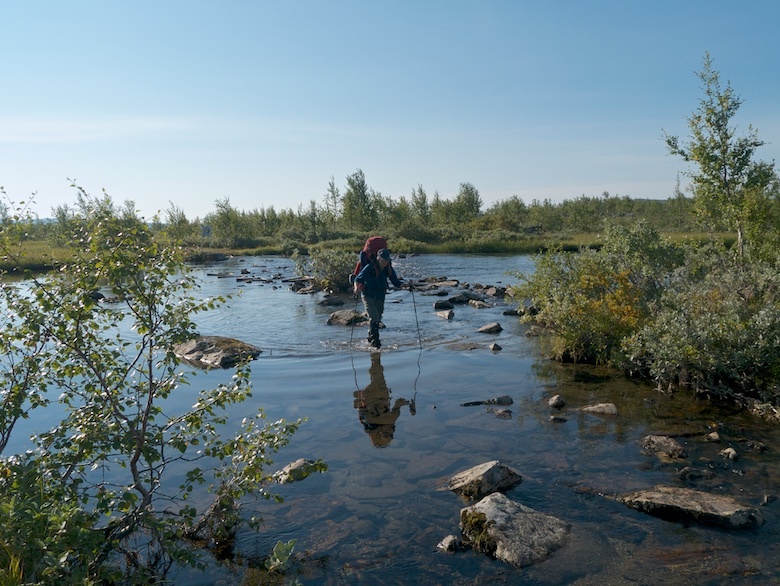 The next river crossing was wide and rocky but also shallow. I was pleased to find a way across without getting my feet wet. 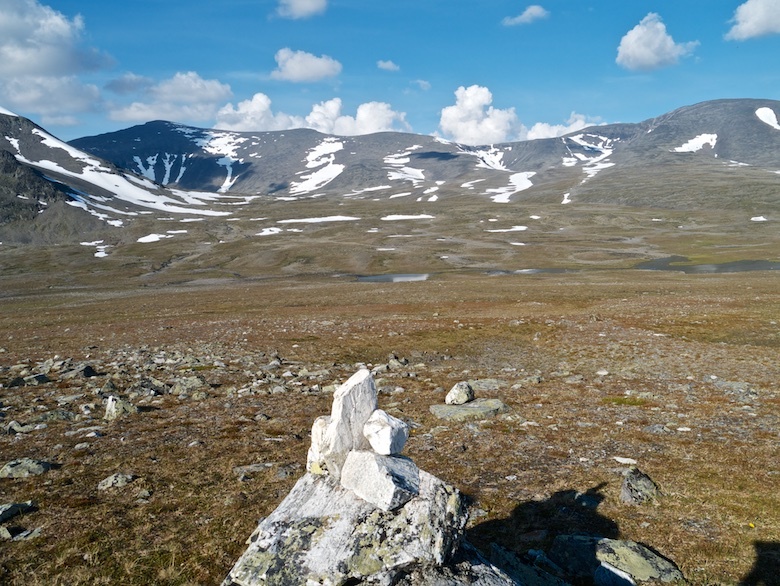 Another long climb followed, the path disappearing underfoot but the occasional cairn marking the way. 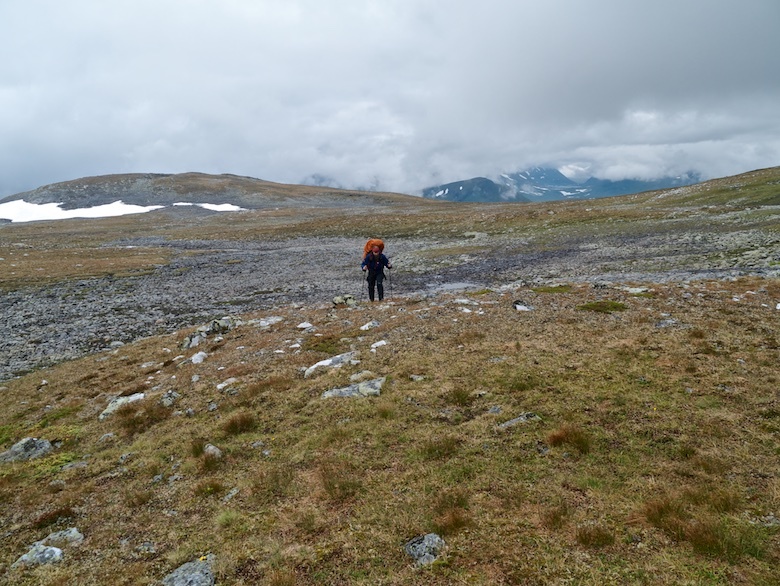 This section was boggy in parts and the mosquitoes and horseflies were still biting, even once we passed the 1000 metre contour. A large snow bank blocked the final slope of the day, unavoidable and increasingly slushy. 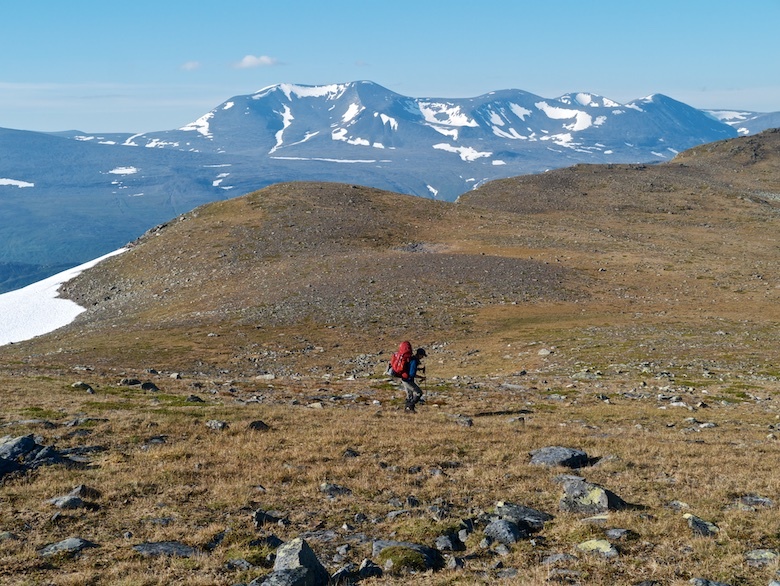 We passed a young couple on their way back to Kvikkjokk, nearly out of food after being in Sarek for ten days. Tanned and fit looking they wished us luck as they headed down the way we had come. 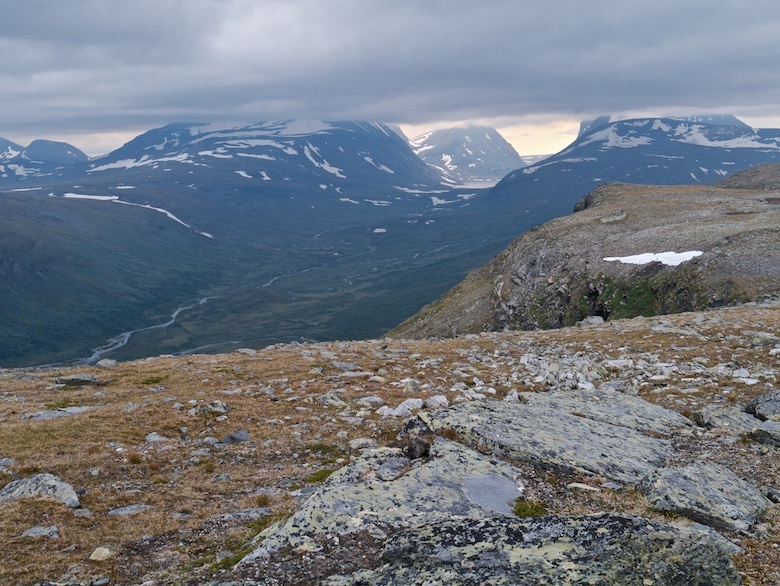 Finally we arrived on the mountain plateau at 1200 metres, an absolutely breathtaking spot. My eyes were immediately drawn to the north-east, a wall of incredible mountains towering above the twin lakes at the head of Njoatsosvagge and our planned destination for the following day. 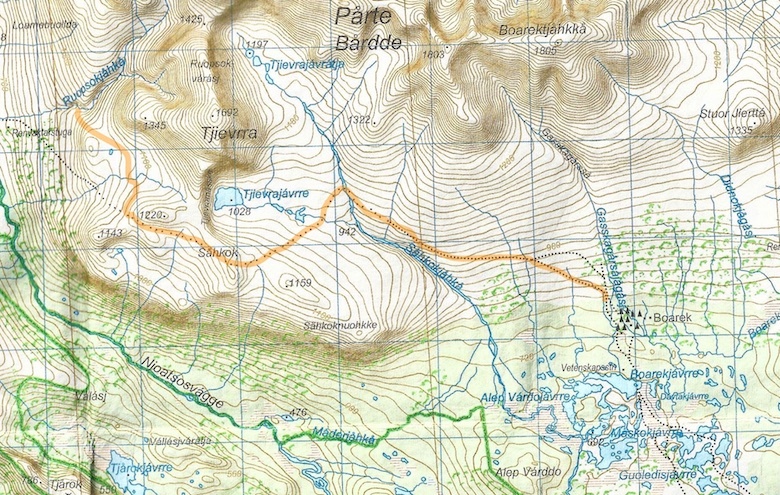 Our route dropped into a large upland bowl at the head of a stream. 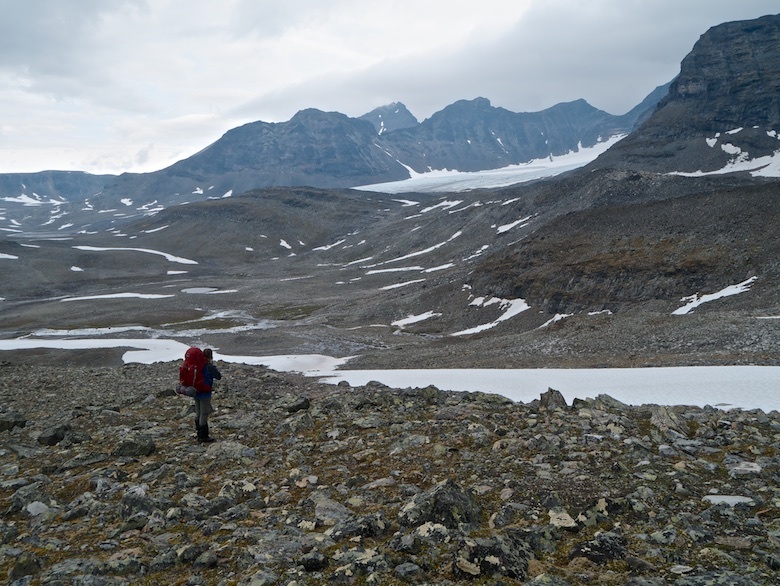 Once again we were short of our intended destination by a few kilometres and it was still early afternoon. However we could not face the long descent down into a valley and the heat and insect life that would bring. The ground next to the stream was soft and springy and there was a gentle breeze blowing. Pretty much perfect. We therefore did not waste much time in pitching the Enan’s. Of course what happened as soon as we had pitched? The breeze dropped and the mosquitoes came out to play. The ones at 1200 metres seemed to be bigger and meaner than the ones we has encountered in the forests. I took myself off to sit on a rocky bluff overlooking the valley for a while, a breeze keeping them at bay. Returning to the tents for dinner it was back on with the windproof and head net in an attempt to keep my sanity. With the sun shining it was far too hot to retire to our tents. 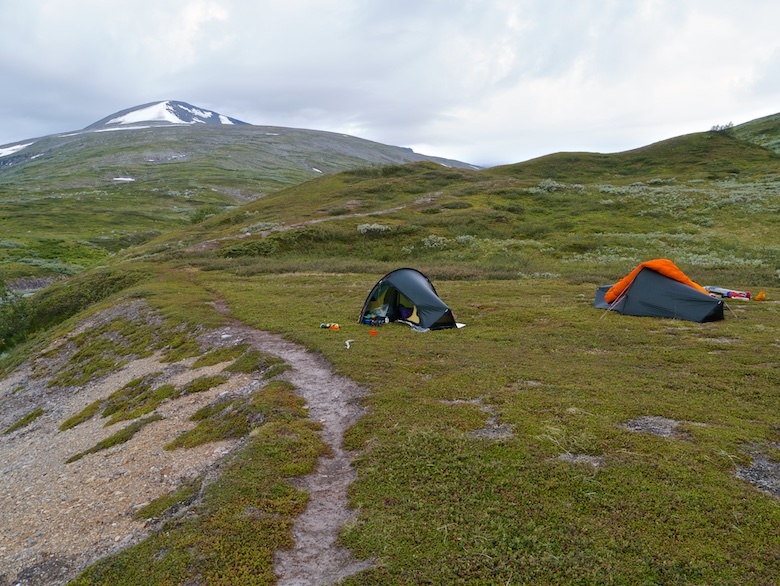 It was hard to believe that we were camped at 1200 metres above the Arctic Circle! 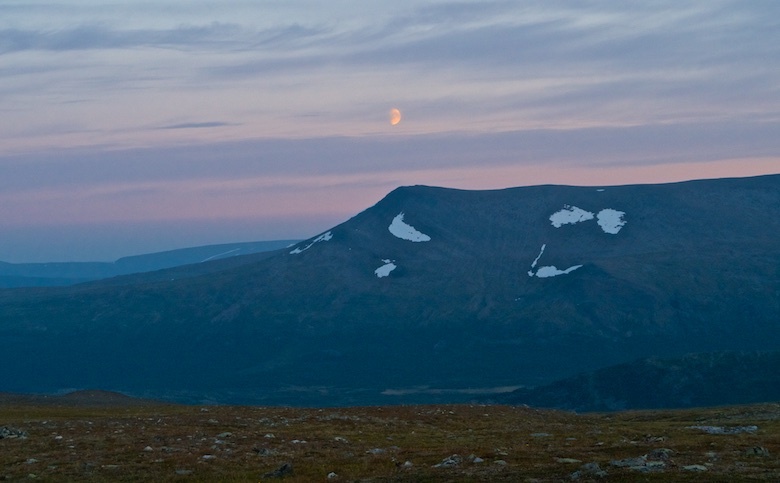 The evening was spent pacing round camp cursing the sun which still sets late at the end of August. Eventually it dipped and the temperature fell enough for us to escape to our tents. 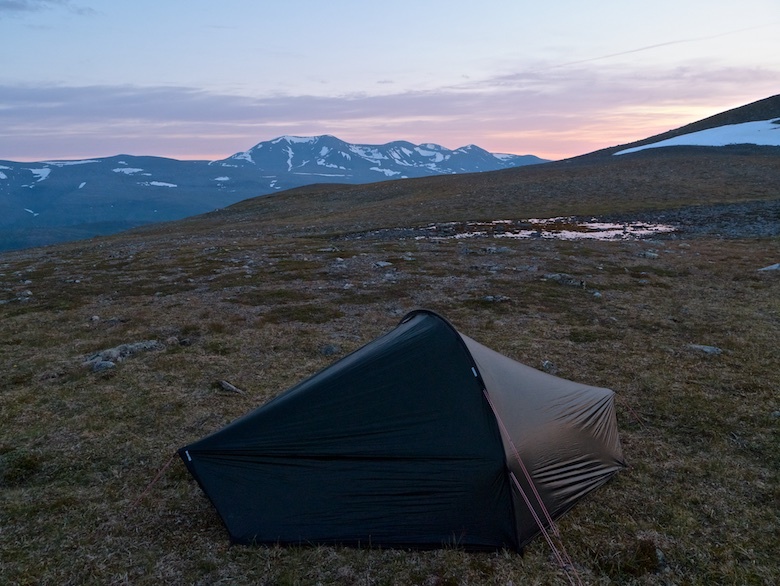 I lay on top of my sleeping bag gazing out through the mesh door watching the light change on the surrounding hills. I must have nodded off because I woke to a clicking noise and some grunts close behind my tent. 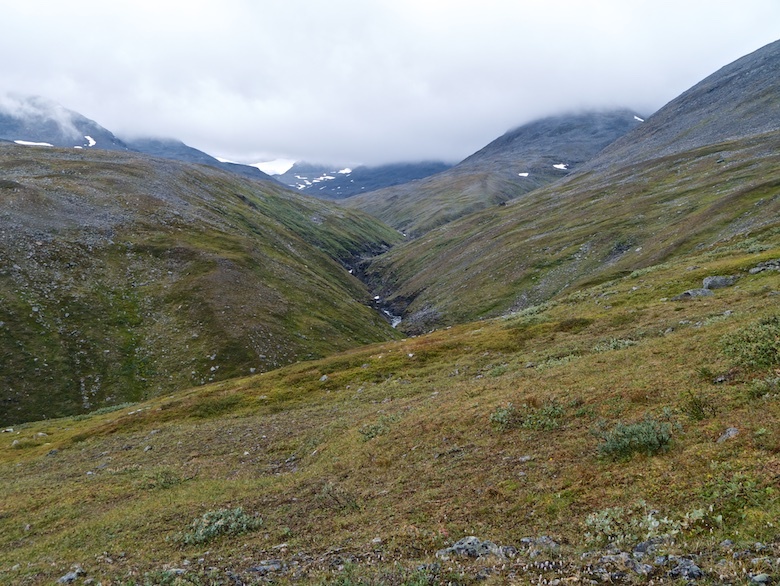 I popped my head out to see a herd of reindeer pass us within a few metres. A real National Geographic moment that I won’t forget. Just a shame that by the time I got my out camera they had moved off. By then the temperature had dropped, the sky blushed pink with the moon beginning to rise. A perfect end to a great day.